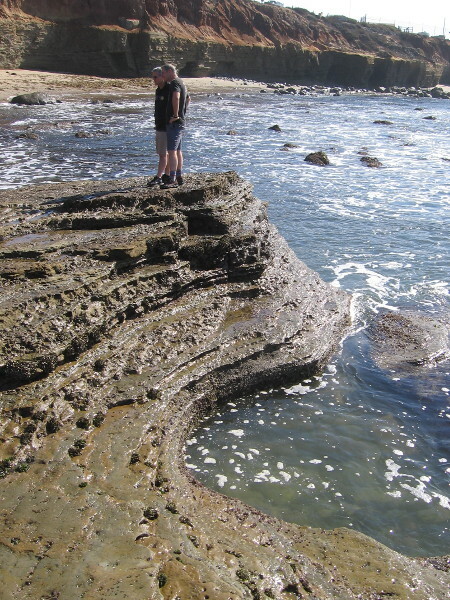 geology – Cool San Diego Sights! 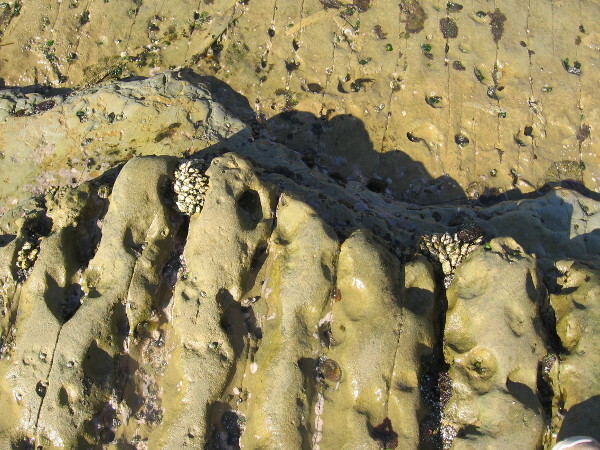 A visit to the Cabrillo National Monument tidepools. 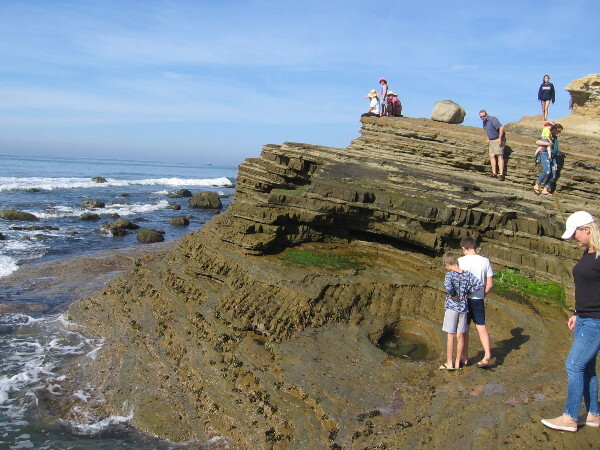 Visitors to Cabrillo National Monument investigate the tidepools. 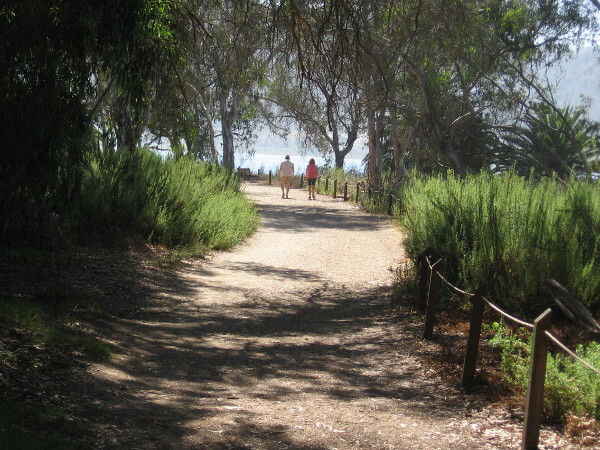 Cabrillo National Monument at the end of San Diego’s Point Loma peninsula is a place of many wonders. 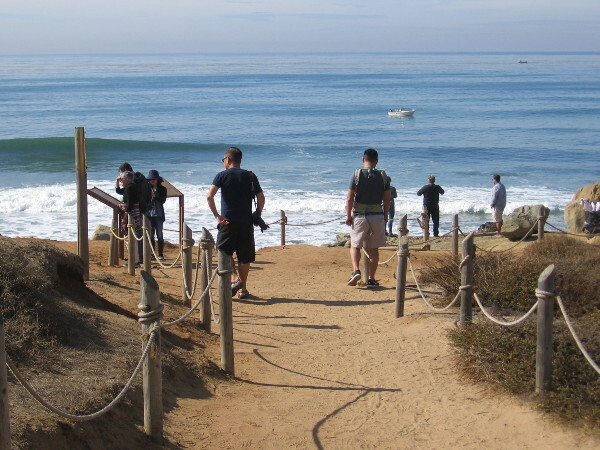 Visitors can enjoy breathtaking views of San Diego, its big, beautiful bay, Coronado’s North Island and the Pacific Ocean. 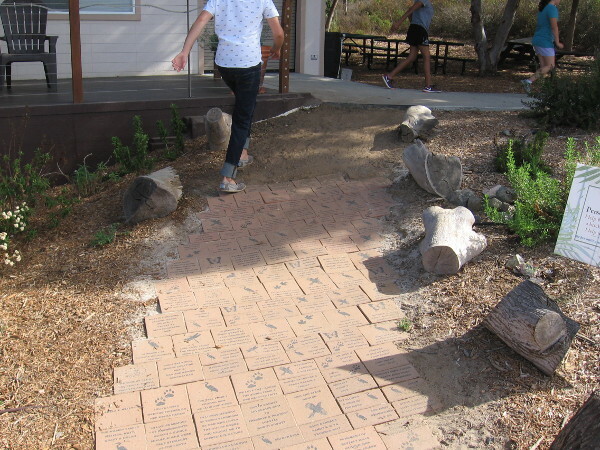 They can enter the Old Point Loma Lighthouse which was built in 1855 to guide ships into San Diego’s harbor. They can see the iconic statue dedicated to Juan Rodríguez Cabrillo, the explorer who discovered San Diego Bay in 1542 on behalf of Spain. 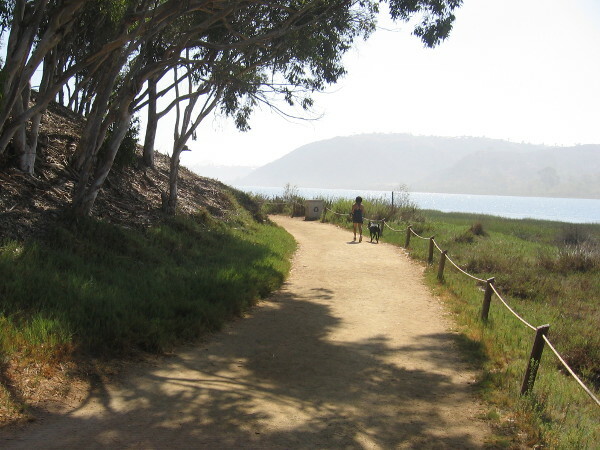 They can watch the migration of gray whales, move through native flora on the Bayside Trail, and check out bunkers that were erected as a coastal defense during World War II. 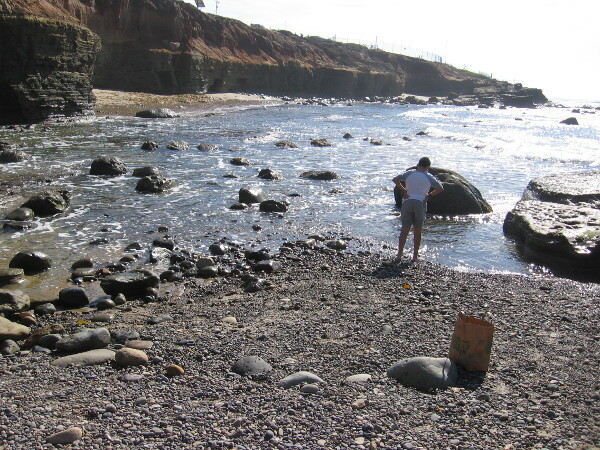 And by heading a little off the beaten track, visitors can also explore amazing tidepools! 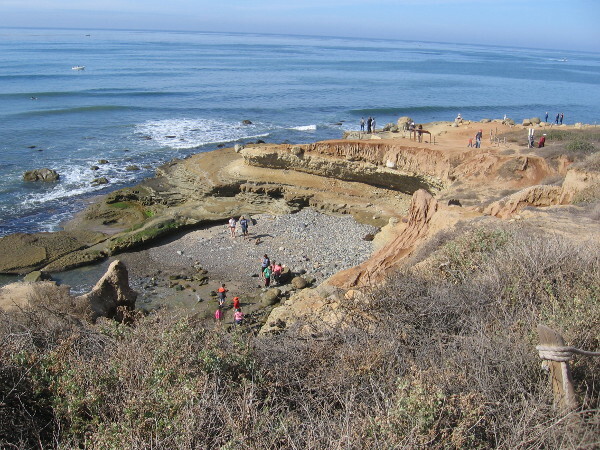 Shortly after passing the park’s Entrance Station, turn right on Cabrillo Road and drive down the hill to the Point Loma Tide Pools. 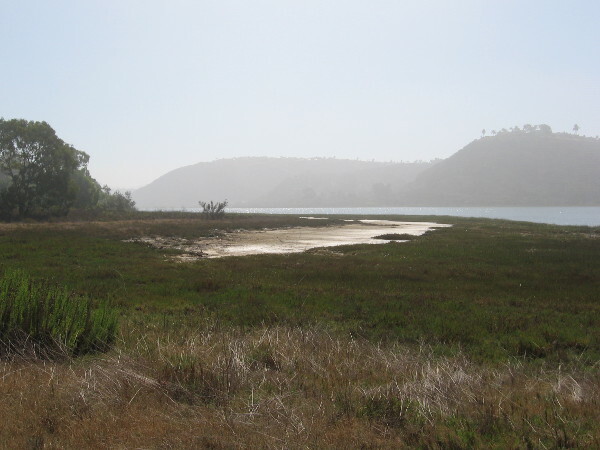 Make sure to arrive around the time of low tide. 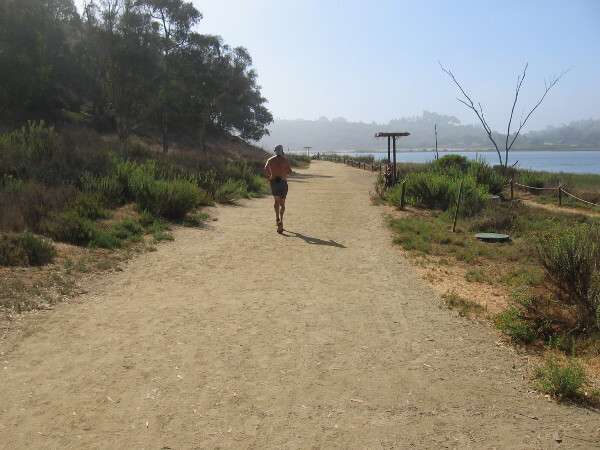 Wear sturdy shoes with good traction. 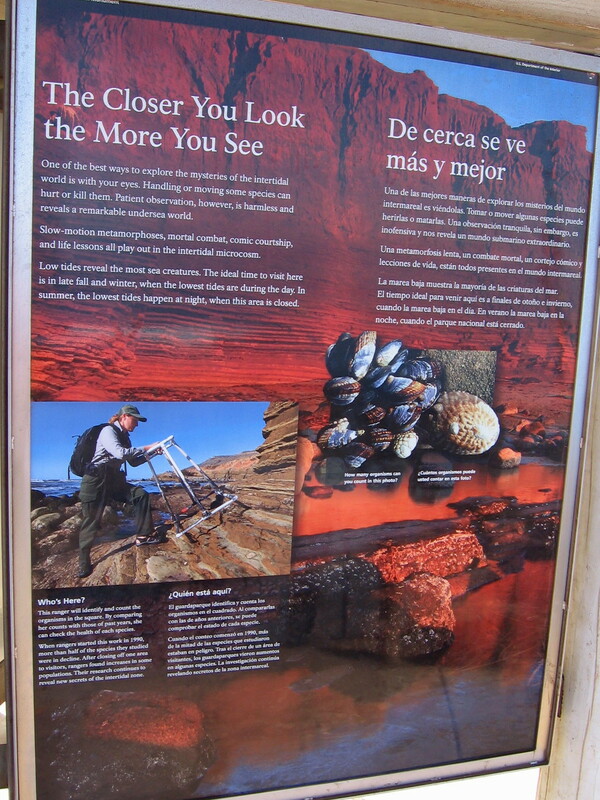 Then carefully walk from the parking lot down a short path to the sandstone cliffs and slippery intertidal zone rocks. That’s where you’ll find abundant sea life. 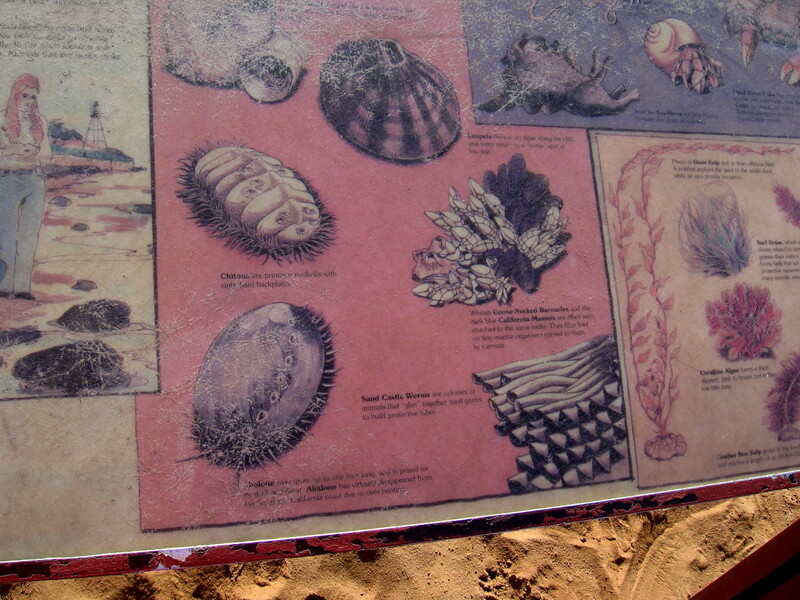 It’s easy to spot all sorts of diverse marine animals, invertebrates and plants at the ocean’s edge. 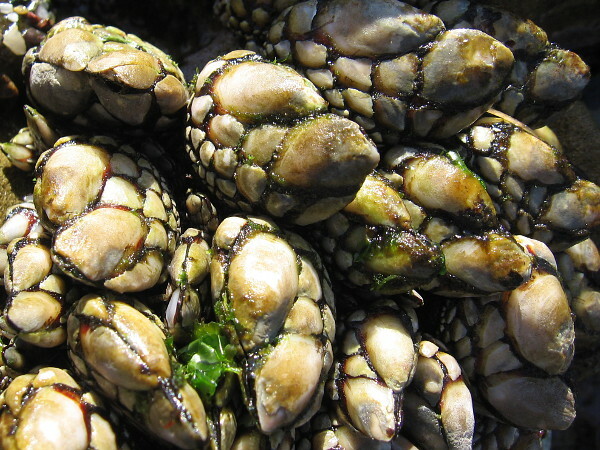 One can find surf grass, sea lettuce, dead man’s fingers, sea hares, lined shore crabs, bat stars, aggregating anemones, sea urchins, limpets, chitons, periwinkle snails, California mussels, lobsters and even small octopuses! 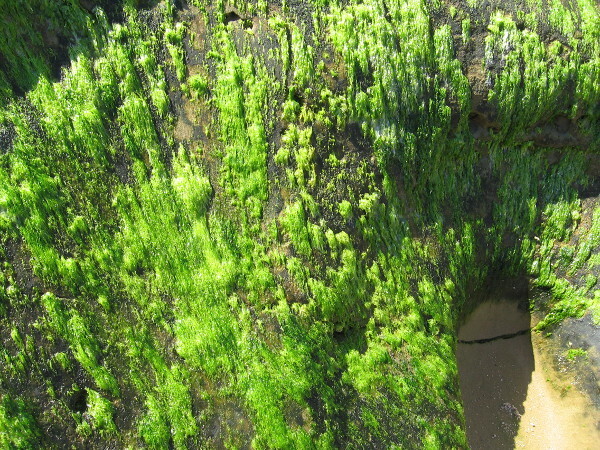 I took some photographs about two hours before low tide! 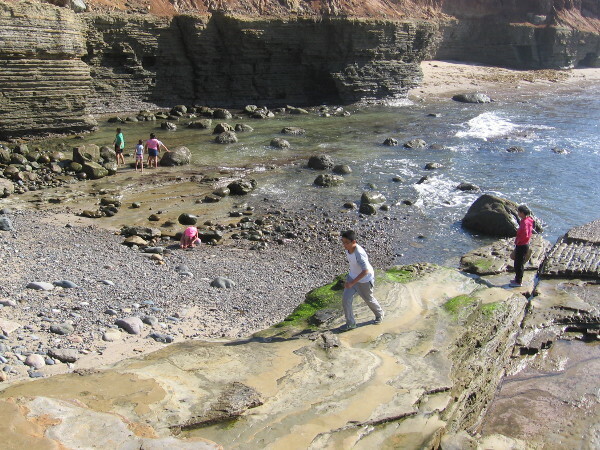 As low tide nears, people look about the rocks and shallow water for signs of sea life. Amazing beauty awaits curious eyes. 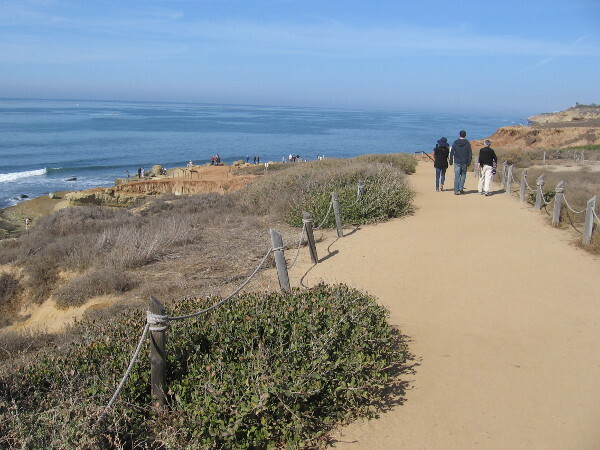 Starting down the path from a parking lot to the Point Loma Tide Pools at Cabrillo National Monument. 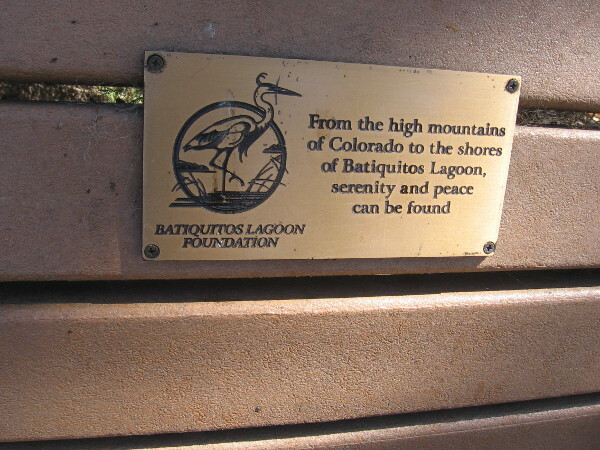 A sign by the path. 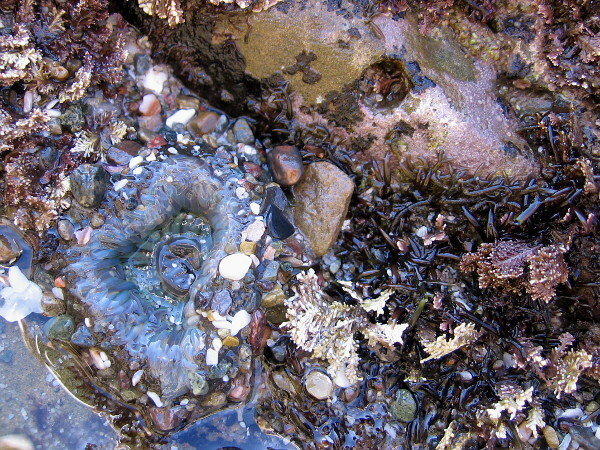 Exploring the rocky intertidal zones is like peering through a window into the ocean’s ecosystem. 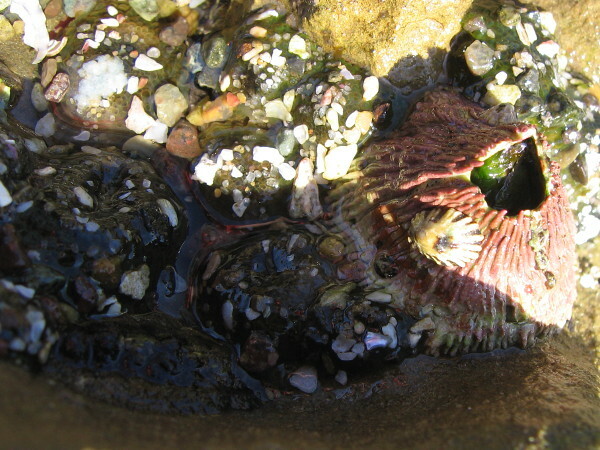 During low tide, marine animals in shallow pools can be closely observed. The closer you look, the more you see. 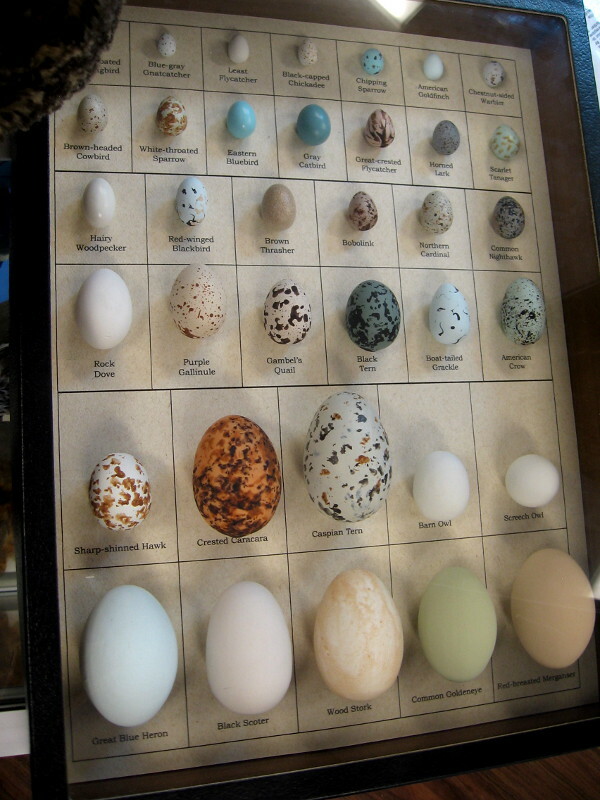 Park rangers periodically identify and count the organisms to monitor the health of each species. 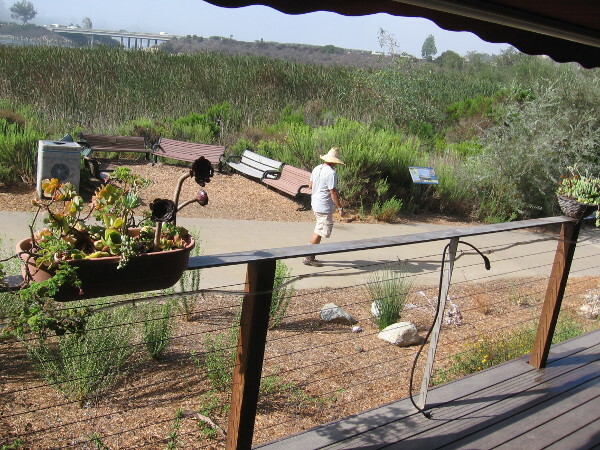 As we head down the dirt path, the tide pool overlook comes into view. 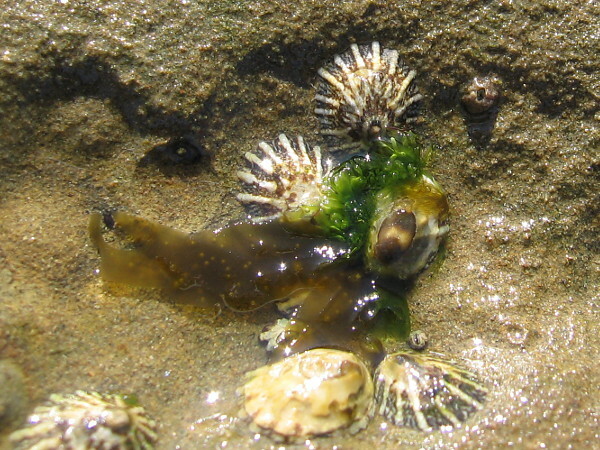 The tide pool area is active with curious visitors. Only two hours until low tide this afternoon. 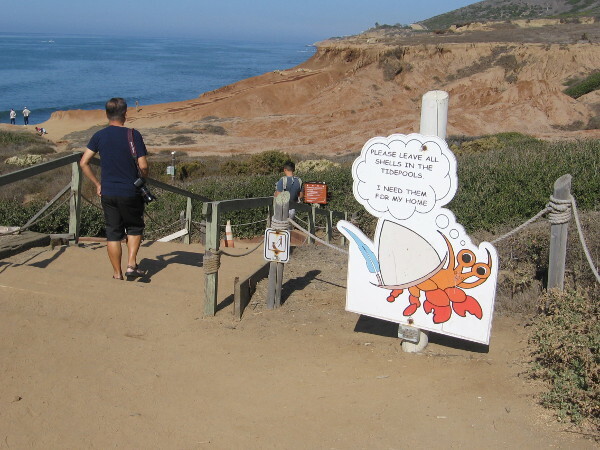 A funny crab asks visitors to please leave all shells in the tidepools. Approaching a pair of information signs atop the overlook. 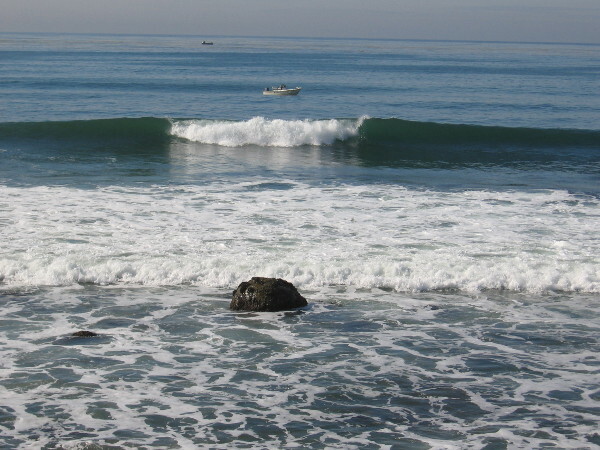 Pacific Ocean waves curl smoothly below. These old signs are very faded, but let’s take a look anyway. You are now standing in the upper limits of the splash zone. The waterline does not come this high, but splash and spray sometimes do. 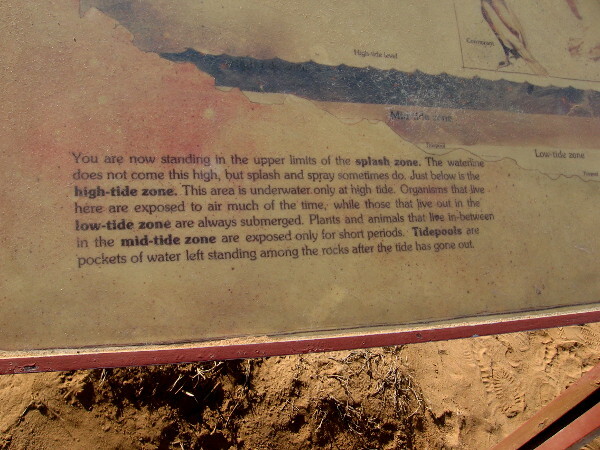 Just below is the high-tide zone. 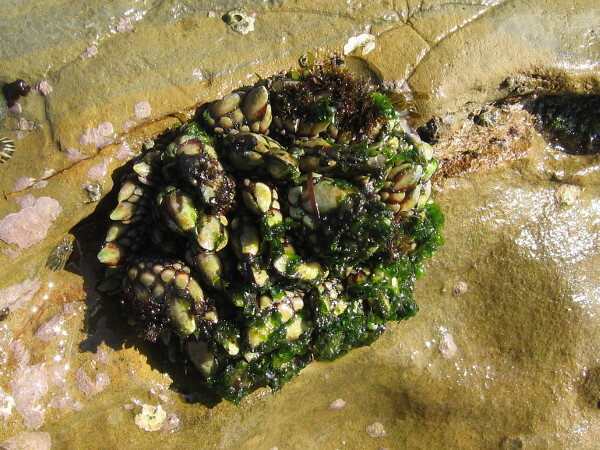 Some organisms pictured are limpets, chitons, sand castle worms, goose-necked barnacles and abalone. 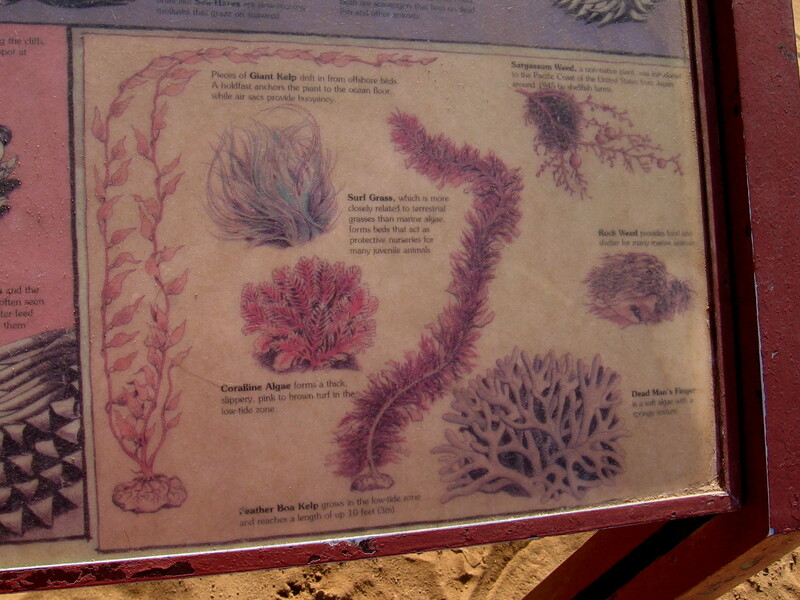 Plant life includes giant kelp, surf grass, coraline algae, rock weed, feather boa kelp and dead man’s finger. 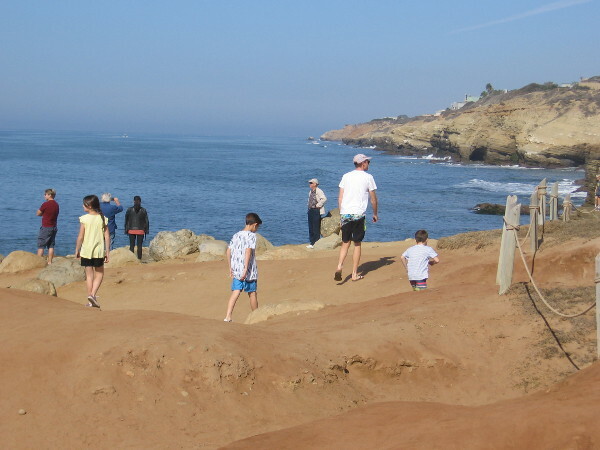 Families enjoy the warm sunshine and smell of the ocean. 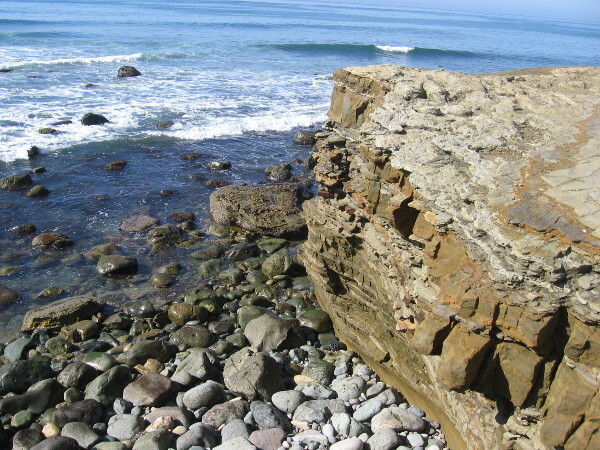 This photo looks north along the sandstone cliffs of Point Loma. 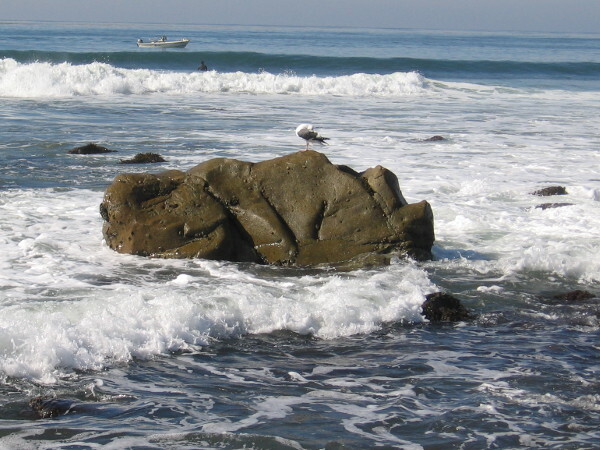 A few rocks stick out of the surf. Fishing boats lie in the water beyond. 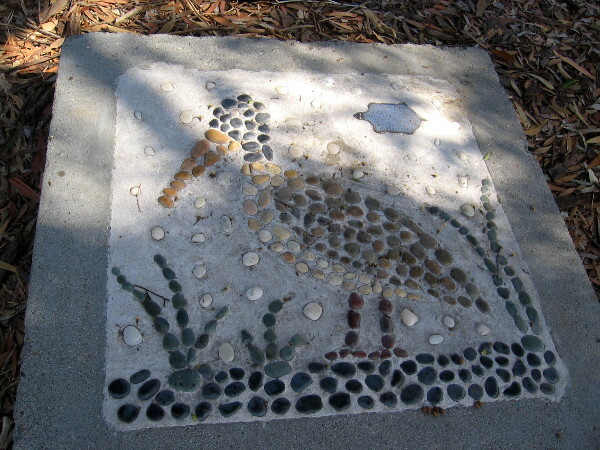 A gull stands upon one of the larger rocks. 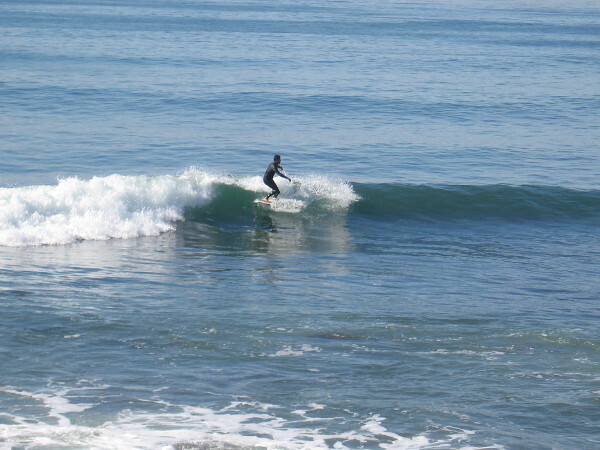 A lone surfer has caught a good wave! 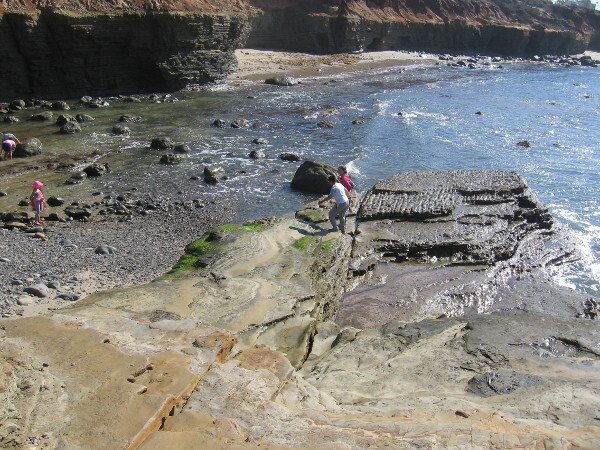 As we head down a short dirt path from the overlook to the tidepool area, we take a closer look at the eroded sandstone cliffs and water-smoothed stones on the narrow beach below. 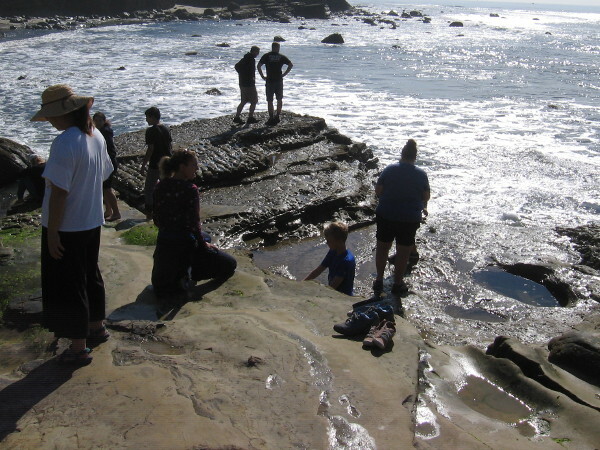 A wide flat rock dips dips toward the ocean at one end of the tidepools, making a perfect platform for exploration when the tide goes out. 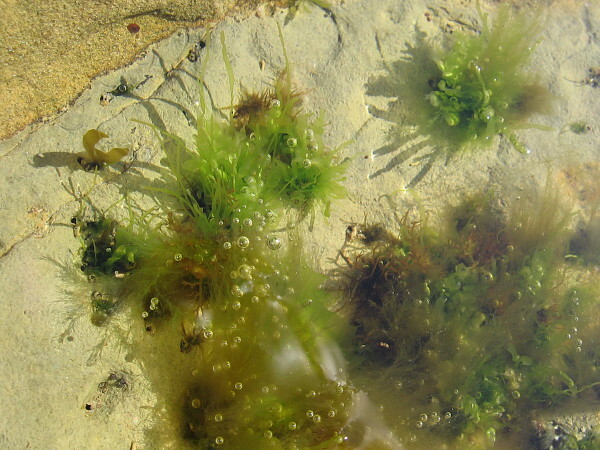 In a couple hours even more tidepools will appear. 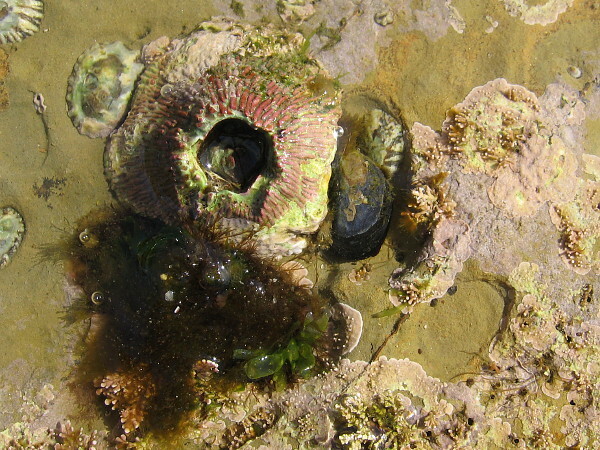 Low tide is the best time to explore the rocky pools of captured water. 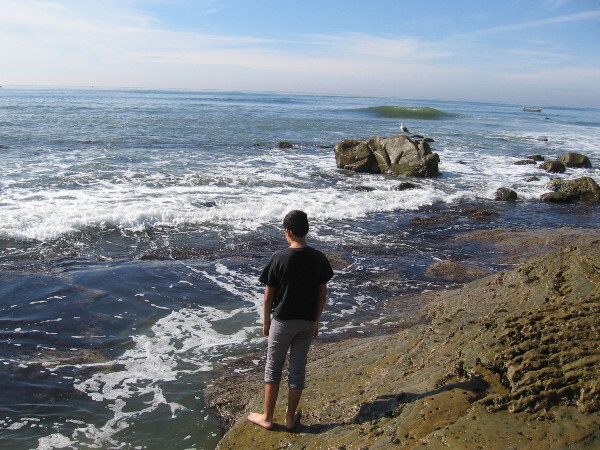 Someone peers down into the shallow water, perhaps looking for an octopus or fish. 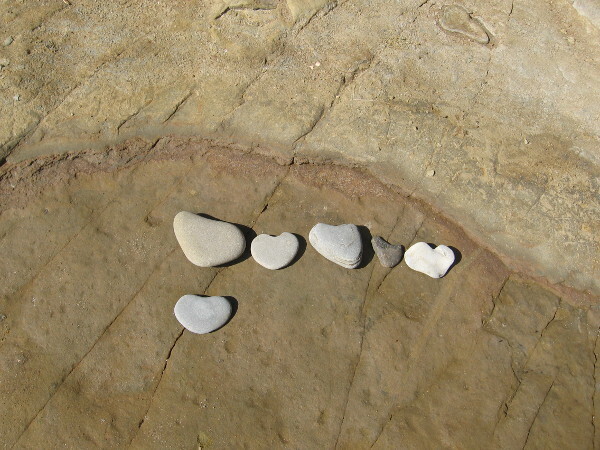 Someone–a young person most likely–searched for heart-shaped stones on the rocky beach and lined them up for all to see. 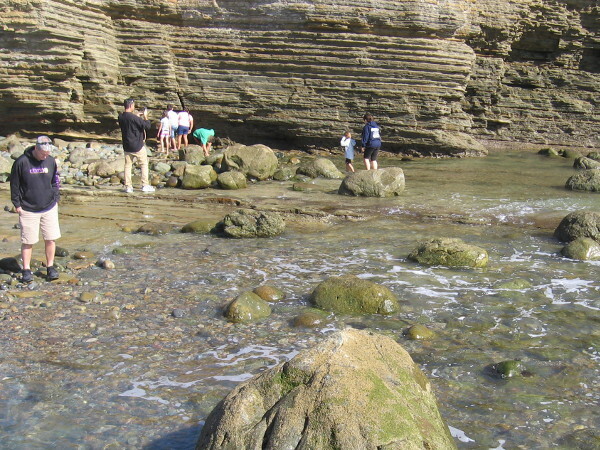 People explore a smooth bowl-like pit in the eroded, layered, tilted sandstone. So much wild natural beauty. So much to contemplate. 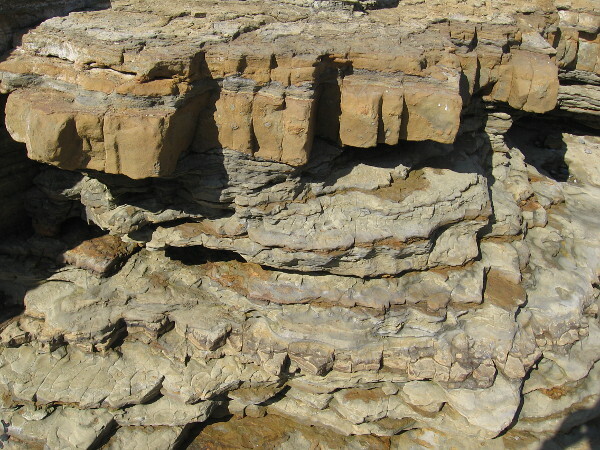 The rock shelf contains parallel fissures and oddly eroded patterns. 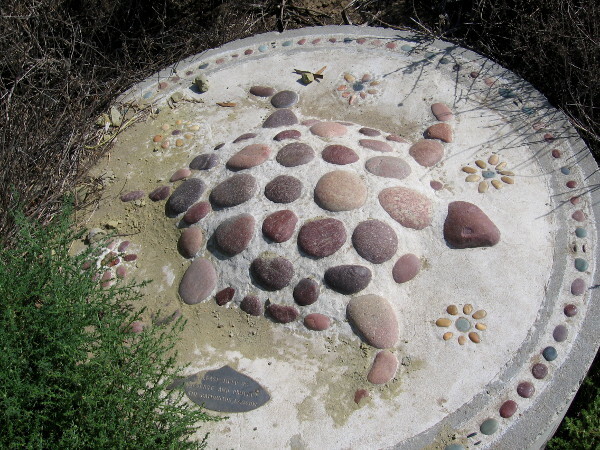 Over many years the rock is weathered, strangely changes. 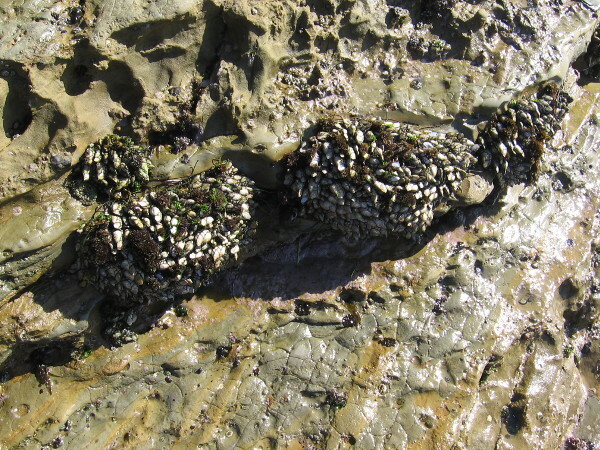 I see some of those whitish goose-necked barnacles. 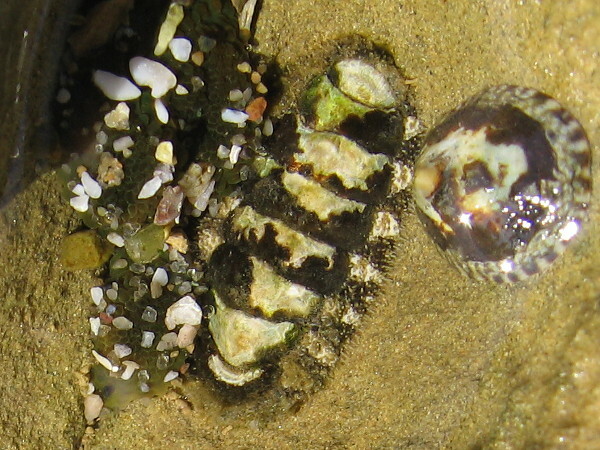 Many of the tiny pits are home to troglodyte chitons. 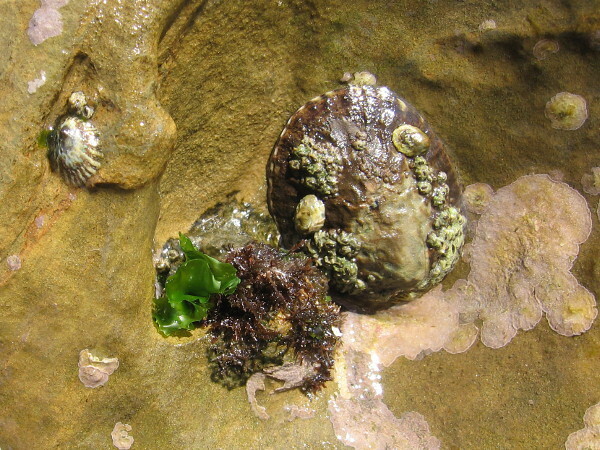 I found some limpets clinging to the wet rock. 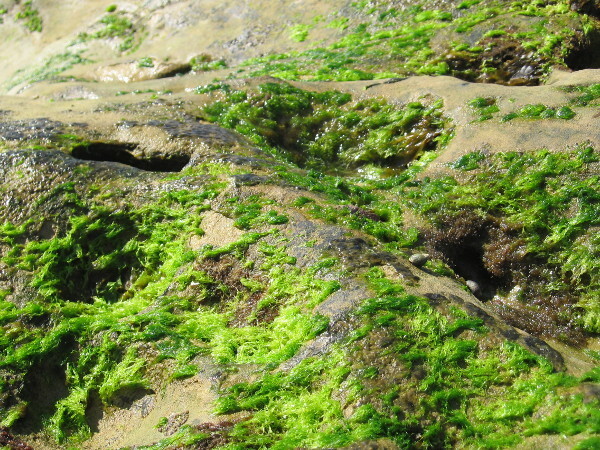 Bright green algae grows on the exposed intertidal rock’s surface. Beauty that defies adequate description. 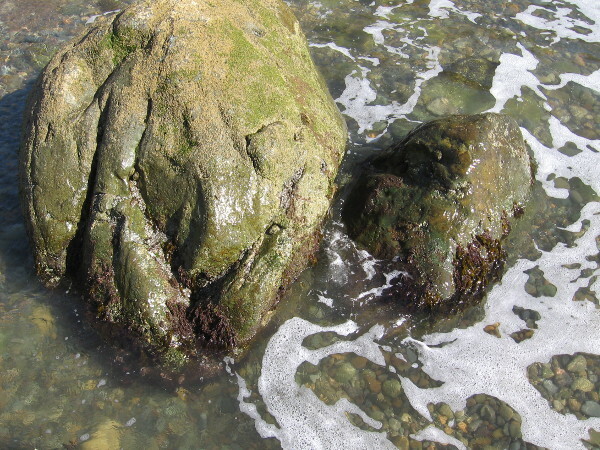 The patient sea washes against these rocks, doing its slow work over the course of countless lifetimes. 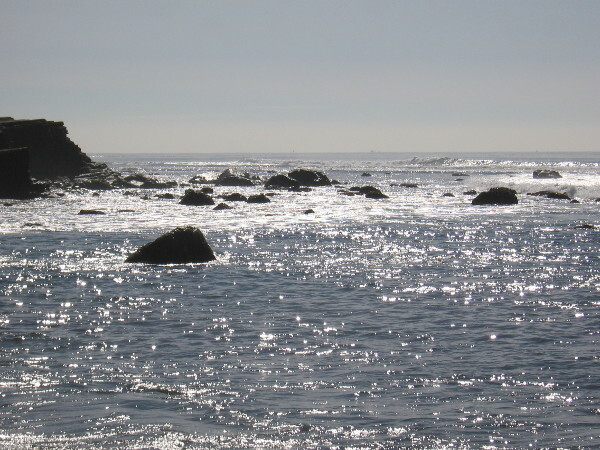 Looking south at light on the water and dark, broken rocks. 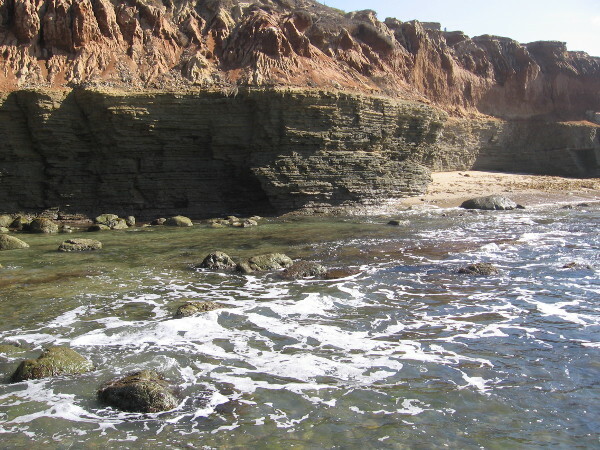 The uplifted then eroded sandstone cliffs tell a story in their book-page-layers about the passage of time. 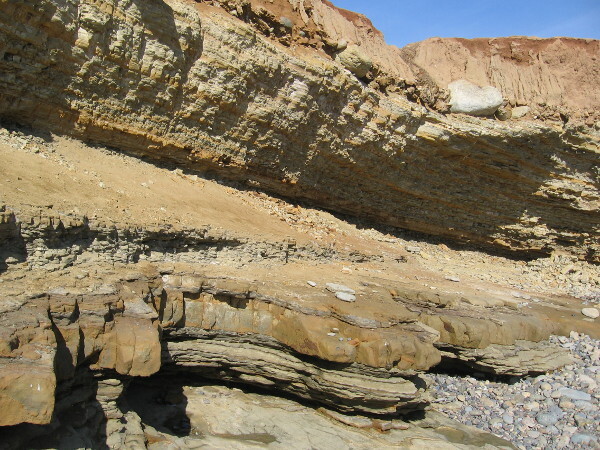 Little piles of sand and stone collect where the cliffs crumble. 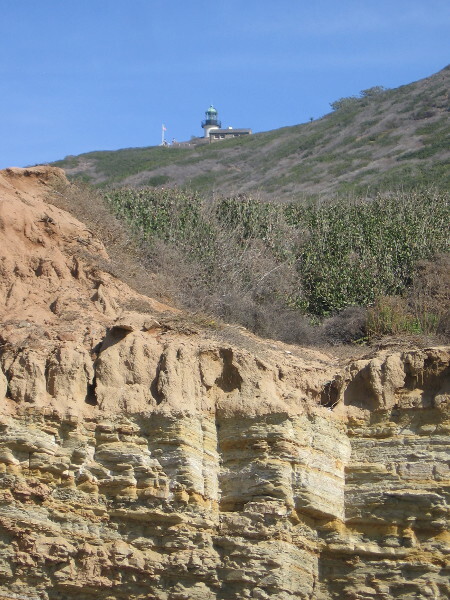 High above, atop Point Loma, I see the Old Point Loma Lighthouse, now a part of human history. Gazing at the sublime work of nature. No human artist could possibly paint this. 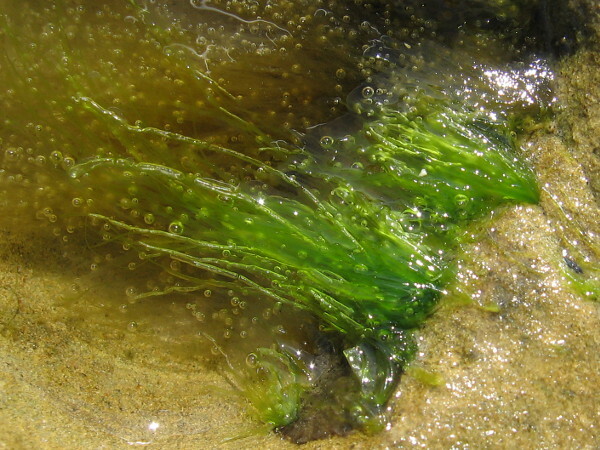 I see a small leaf of sea lettuce! 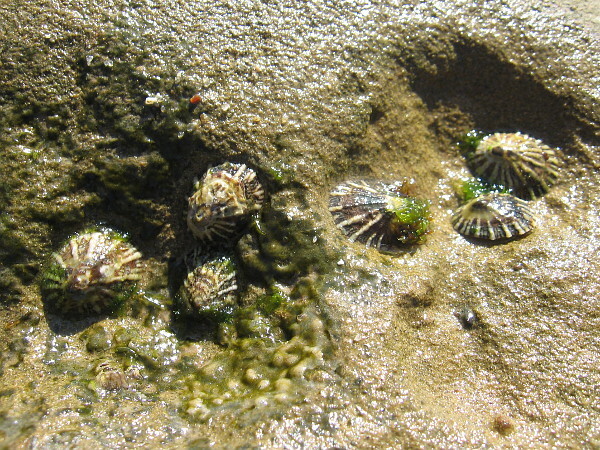 An aggregating anemone has collected fragments of shell and grains of sand. A young boy walked up to me as I photographed this small scene and said that it looks like a volcano. On the surface of Mars, I thought to myself. Like a glittering hidden treasure. 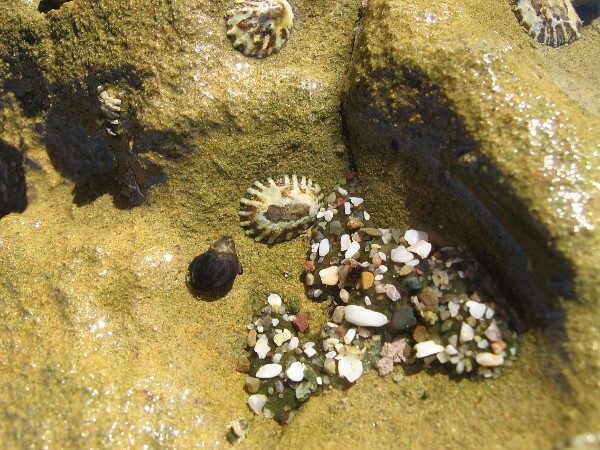 A chiton between an anemone and a limpet. 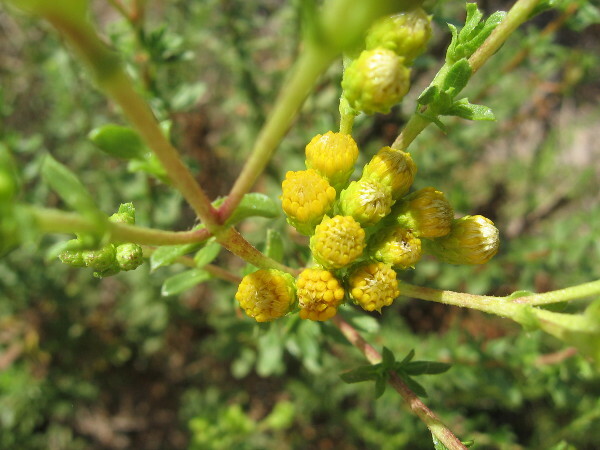 Another close look at nature’s awesome and infinite beauty. 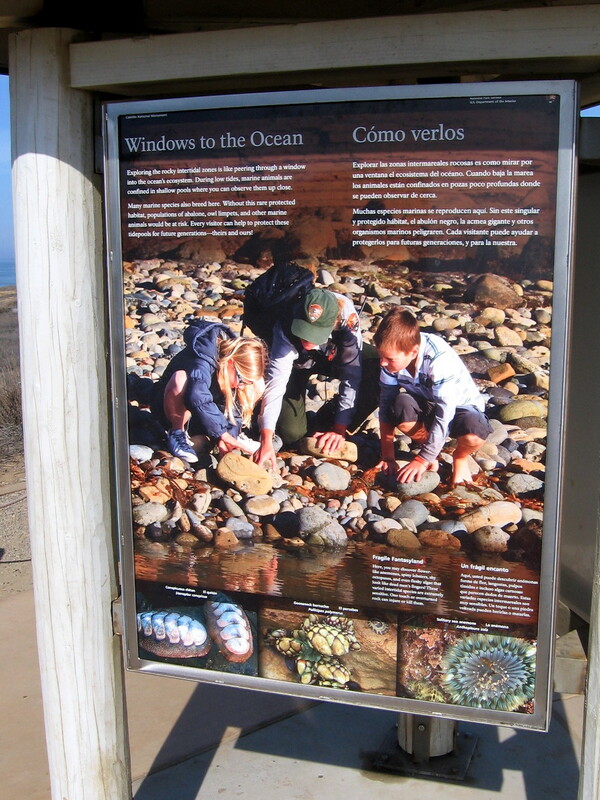 Posted on November 21, 2018 November 22, 2018 Tags animals, beaches, beautiful, cabrillo national monument, geology, marine biology, pacific ocean, photography, plants, point loma, san diego, tourism, travel, wildlifeLeave a comment on A visit to the Cabrillo National Monument tidepools. 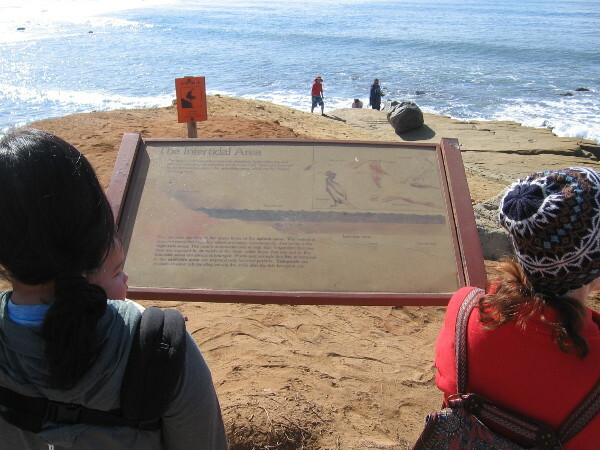 Learning about archaeology in San Diego! 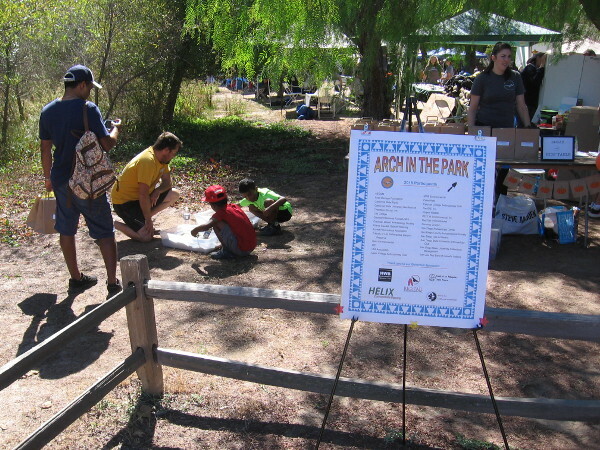 Kids learn about archaeology at Arch In The Park, an annual educational event near the Historic Ranch House in Los Peñasquitos Canyon Preserve. 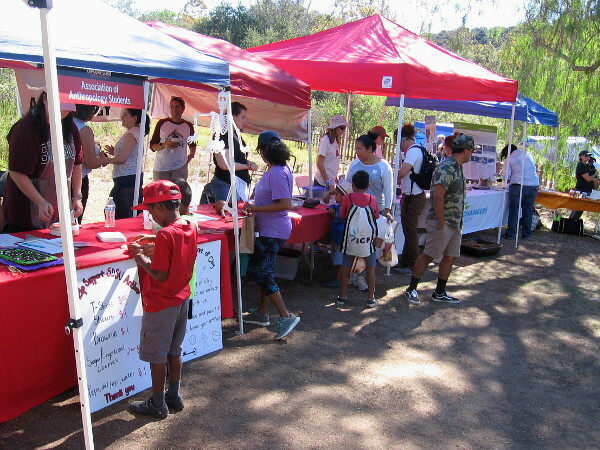 Today I headed to the Historic Ranch House in Los Peñasquitos Canyon Preserve to enjoy the 20th Annual Arch In The Park! 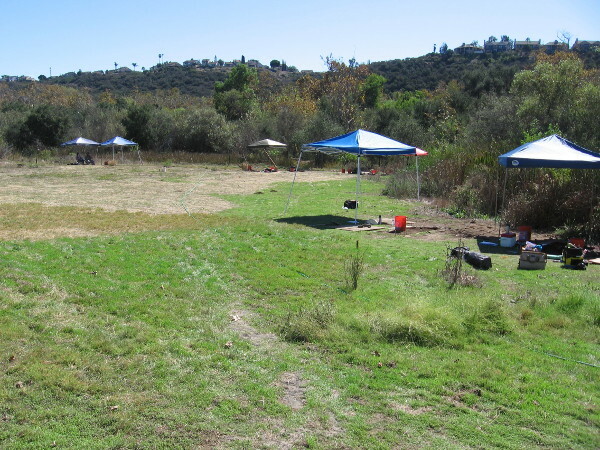 Arch In The Park, hosted by the San Diego County Archaeological Society, is an educational event where curious people of all ages can learn about archaeology in San Diego and the surrounding Southern California region! 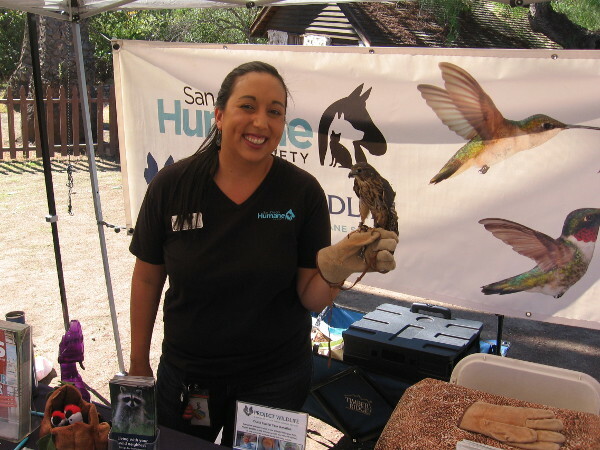 I enjoyed looking at many displays and learning about opportunities to intern and volunteer with different organizations. 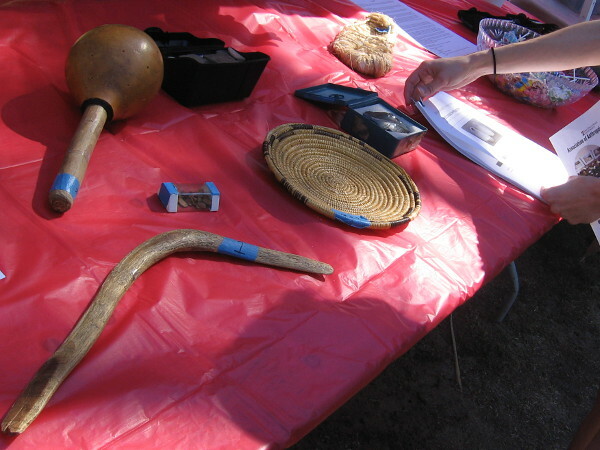 Students talked about what they were learning, and kids got a glimpse of what it’s like to work as an archaeologist. 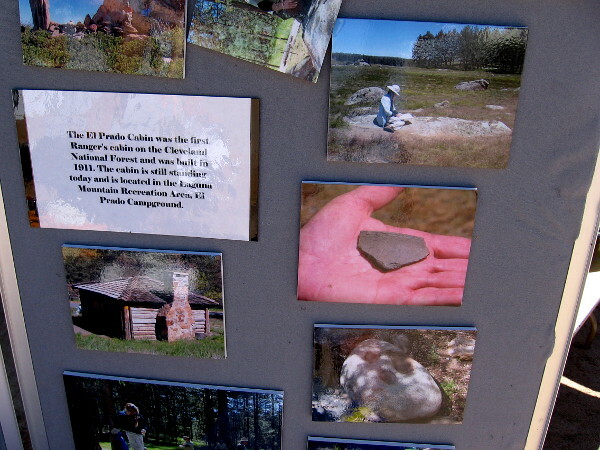 Other exhibits concerned anthropology, our natural environment, and enjoying our local State Parks and National Forests. 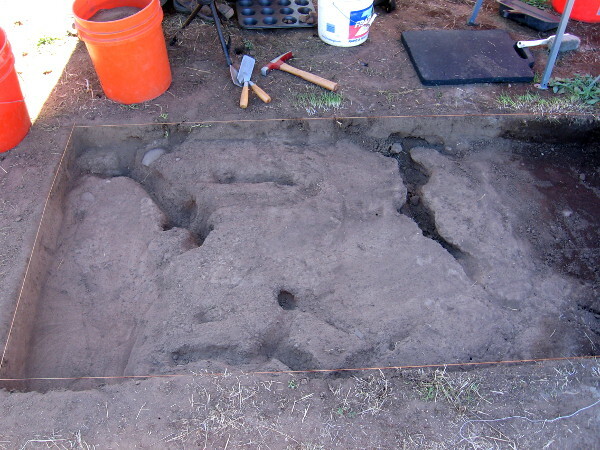 After I checked out the various booths near the old adobe Ranch House, I headed to a nearby field where actual excavations could be viewed. 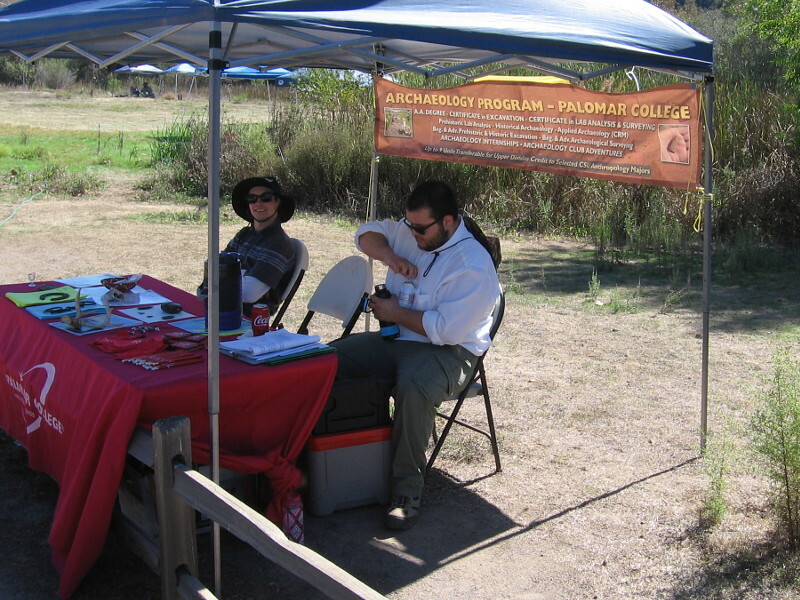 Archaeology students from Palomar College told me about what they were doing, how they were doing it, and what they’d discovered! To read information on the following posters, click my images and they will enlarge. 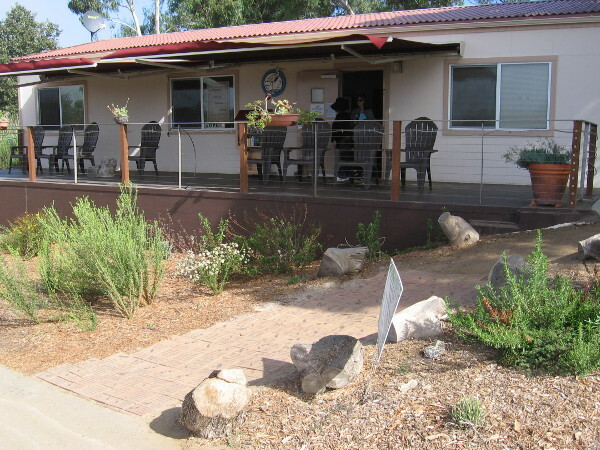 If you’d like to learn more about the historic Los Peñasquitos Ranch House, click here! 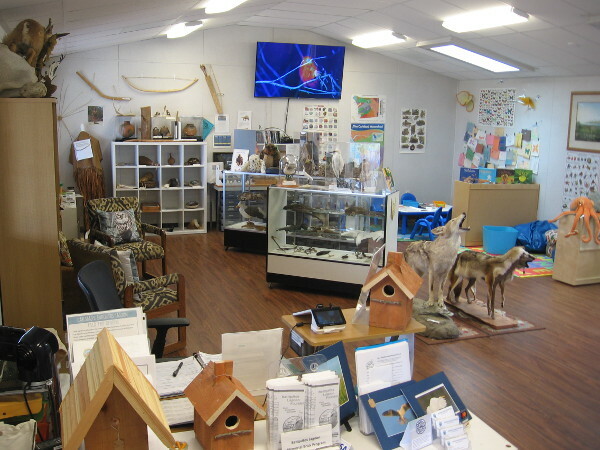 Visitors check out displays by colleges, businesses and organizations concerning the region’s archaeology, anthropology and natural environment. 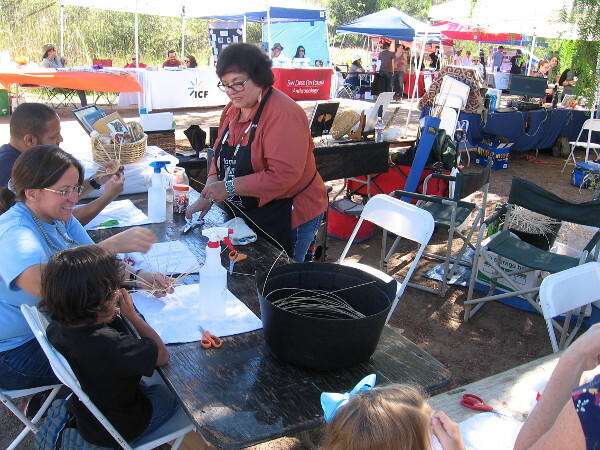 People learn to how to weave baskets, an essential skill of the region’s Native American Kumeyaay people. 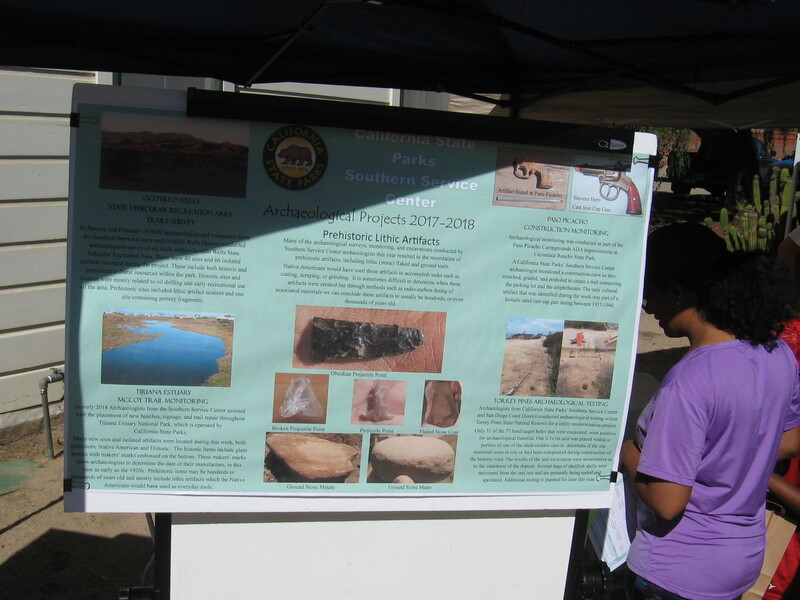 A poster shows California State Parks Southern Service Center’s various Archaeological Projects 2017-2018. 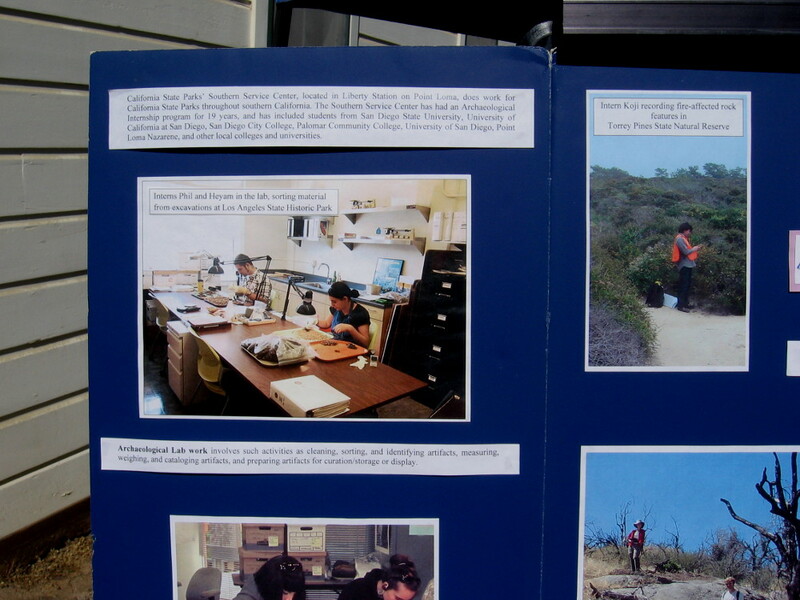 Another California State Parks display shows interns at work sorting and identifying material from excavations in Southern California. 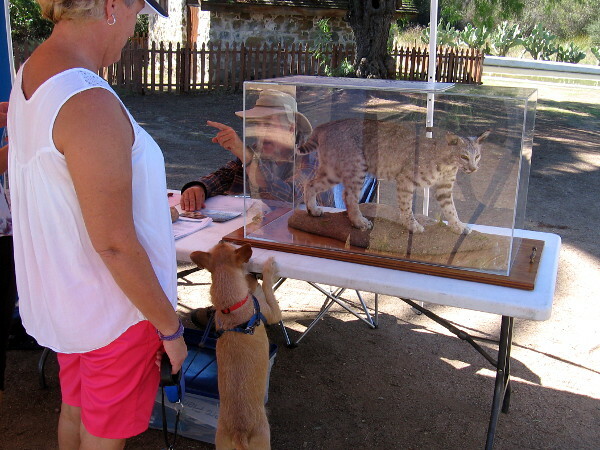 This curious dog was more interested in learning about archaeology than that nearby bobcat. 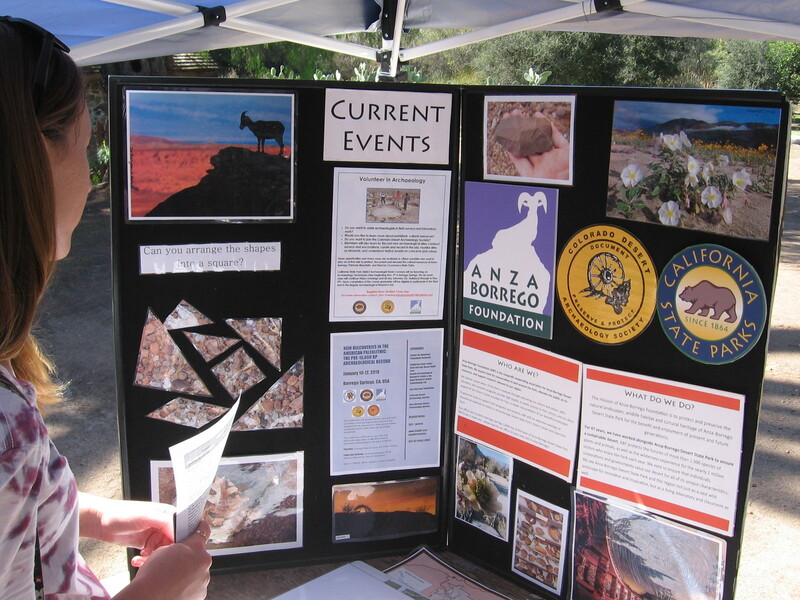 A display contains info regarding the Anza Borrego Foundation and the Colorado Desert Archaeology Society. 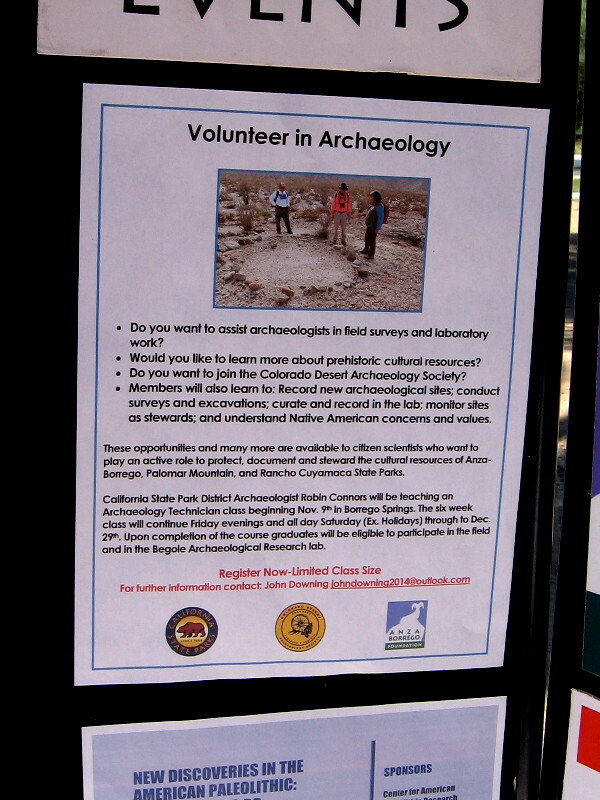 Members of the Colorado Desert Archaeology Society can volunteer and become citizen scientists at Anza Borrego, Palomar Mountain and Rancho Cuyamaca State Parks! 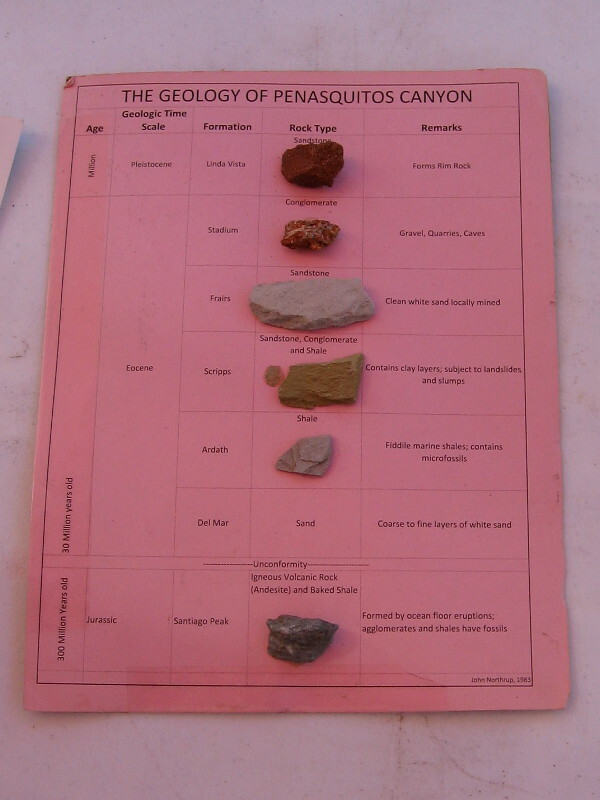 Rock samples from different geological formations in Penasquitos Canyon. 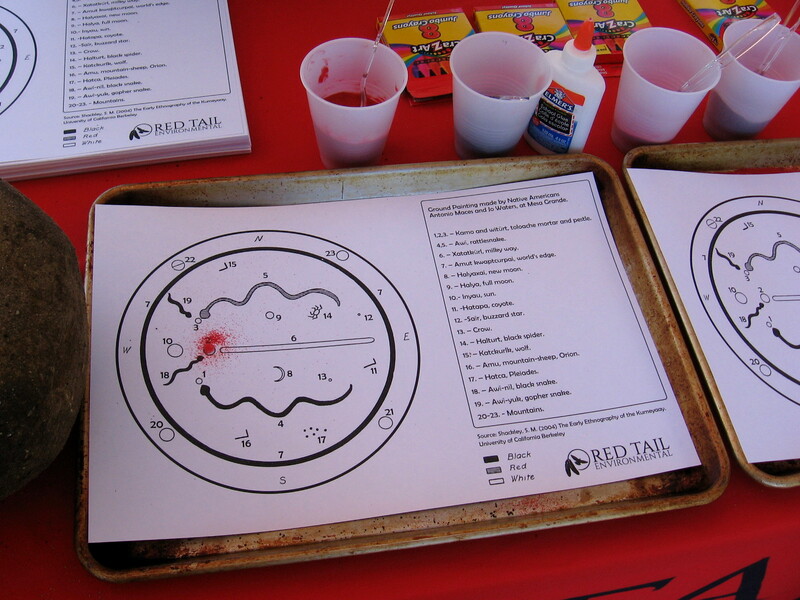 At Red Tail Environmental’s table, kids could create sand art based on a ground painting by Native Americans at Mesa Grande. 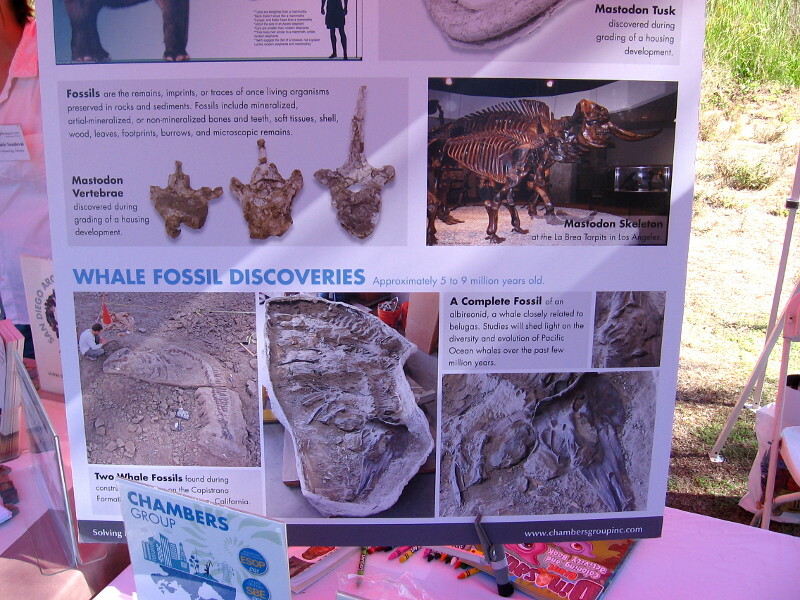 Chambers Group had an interesting poster concerning fossil mastodons and whales. 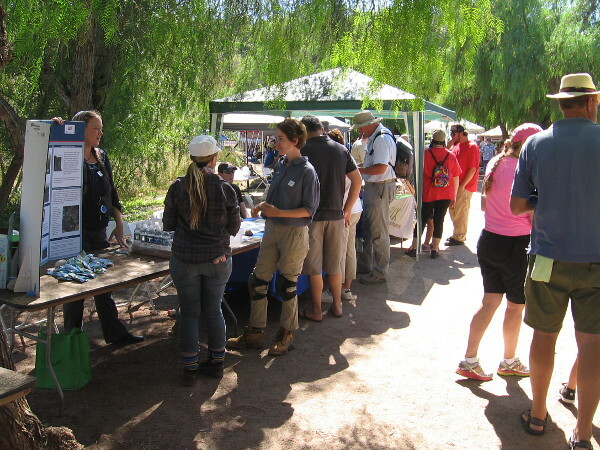 Enjoying a sunny San Diego day at Arch In The Park, presented each year by the San Diego County Archaeological Society. 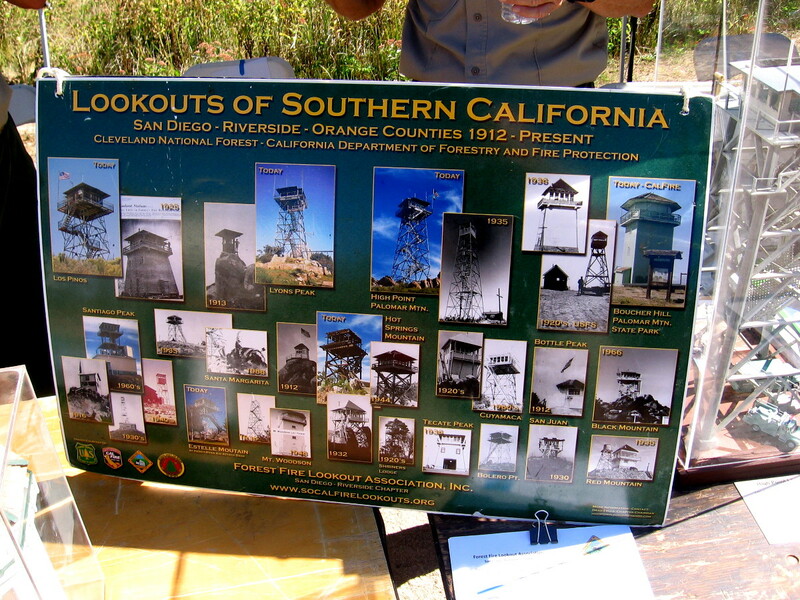 The Forest Fire Lookout Association had a cool display of all the Lookouts of Southern California. When smoke is spotted from a fire lookout, this simple device is used. 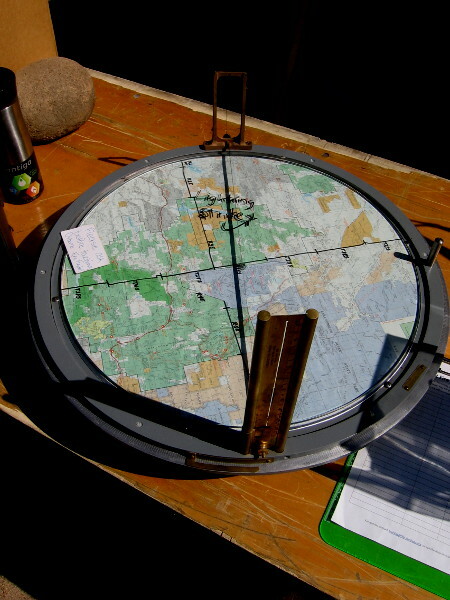 Visually lining up the sighting determines the fire’s direction, or azimuth. 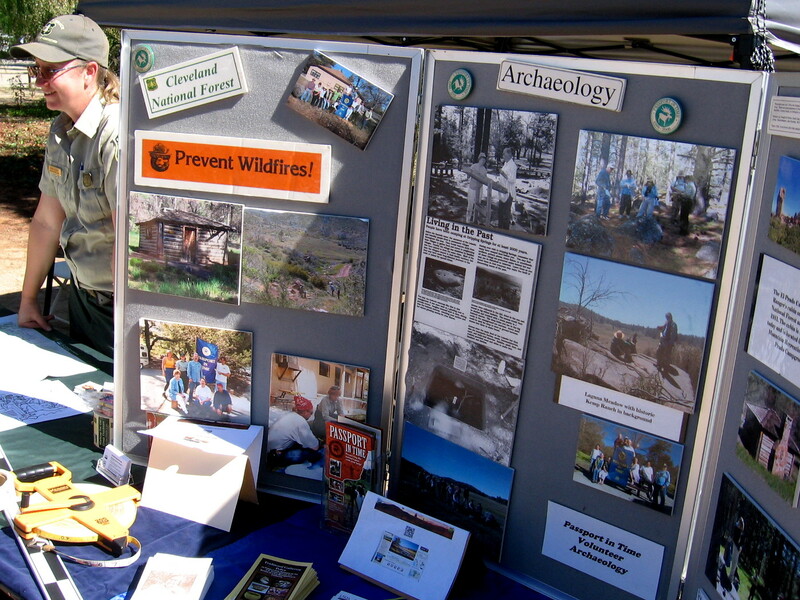 Cleveland National Forest had a big display, too. They also love volunteers. 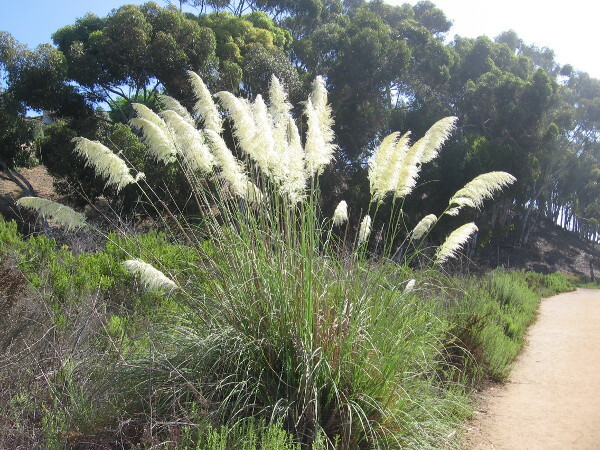 Some photos from the Laguna Mountain Recreation Area, one of my favorite places. 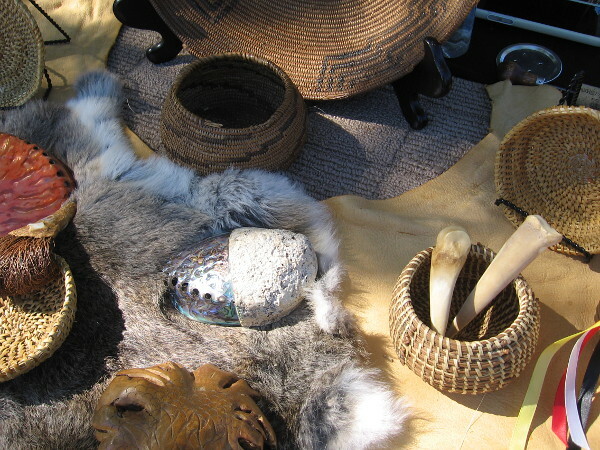 Some artifacts on display created by Native Americans from San Luis Rey. 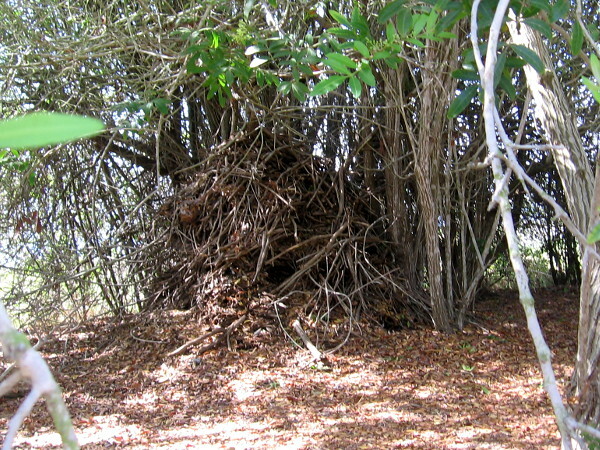 Two of the baskets (near the top of this photo) were made in the 1800s. 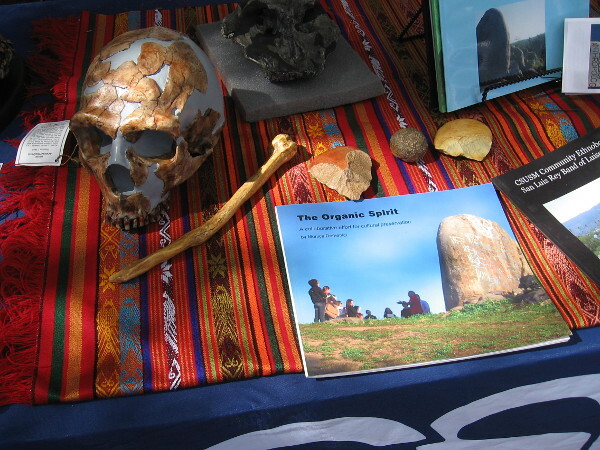 A friendly student at this table talked to visitors about the California State University San Marcos Anthropology Club. 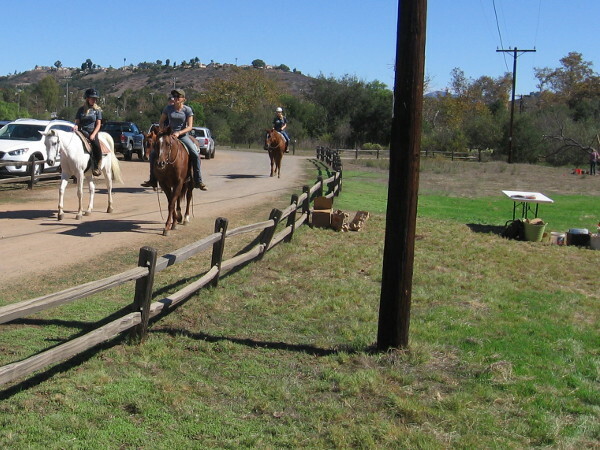 As I headed over to a field where real archaeological digs can be seen, I was passed by people on horseback, enjoying their day at Los Peñasquitos Canyon Preserve. 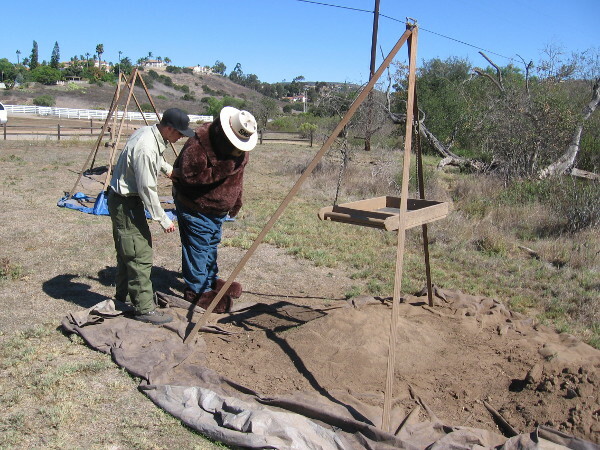 Excavations at Los Peñasquitos Canyon Preserve are carried out by students in the Archaeology Program at Palomar College. 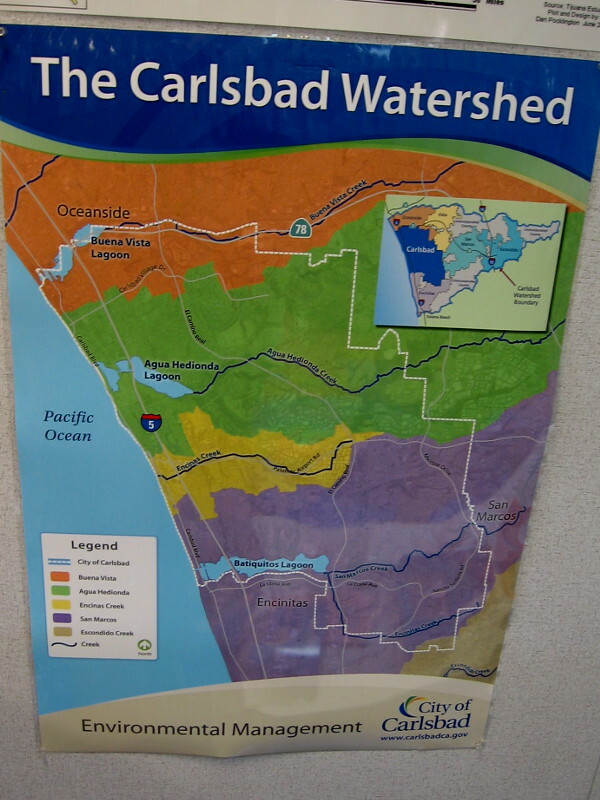 I learned the Kumeyaay in this region obtained obsidian for projectile points by trading with other native people who lived to the east, by the Salton Sea. 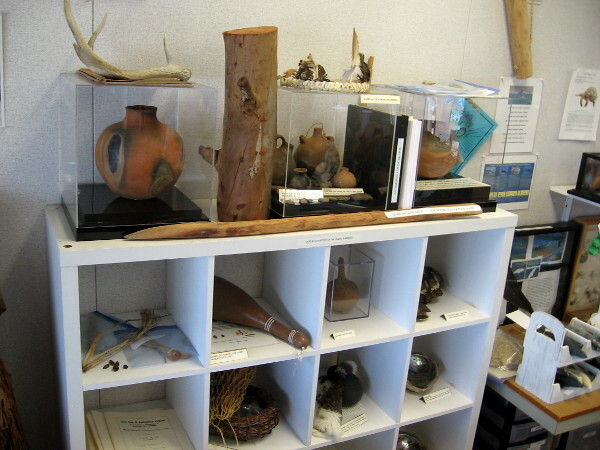 Ancient arrowheads and other mysterious objects are sometimes unearthed in this area. 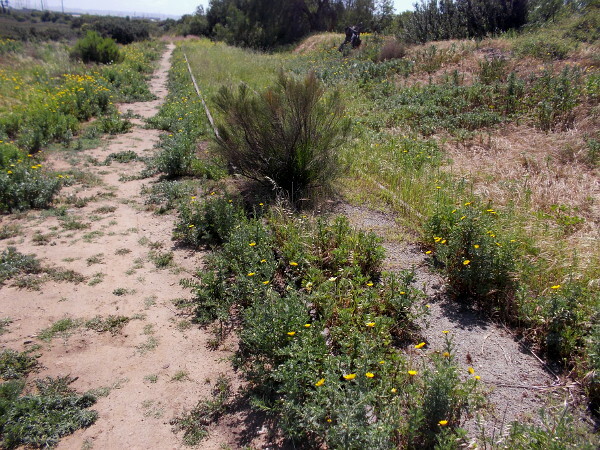 A field east of the Los Peñasquitos Ranch House where archaeology students search for clues about the historic and prehistoric past. Walls and drainage structures poke out from the field. Their exact story is a puzzle that will eventually be pieced together. 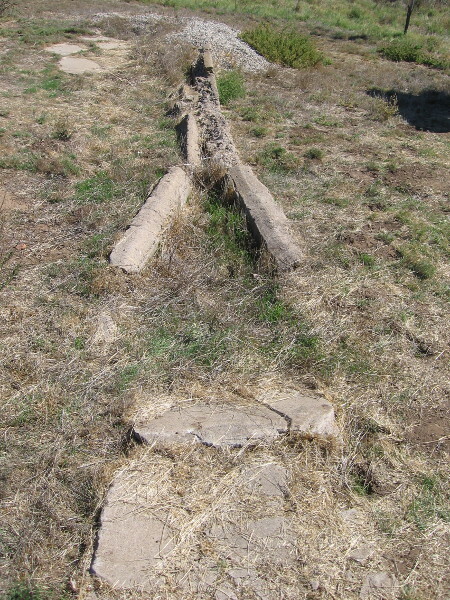 A part of a torn down barn’s foundation has been discovered here. Small, interesting finds are collected by general type in a cupcake pan! 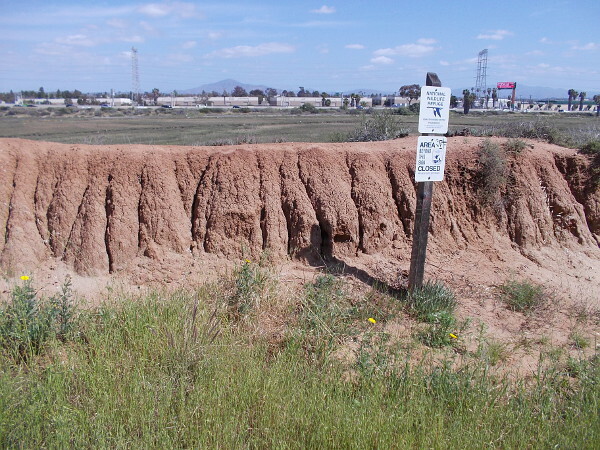 Tunneling gophers make reconstructing the past more difficult. They move materials about as they dig. 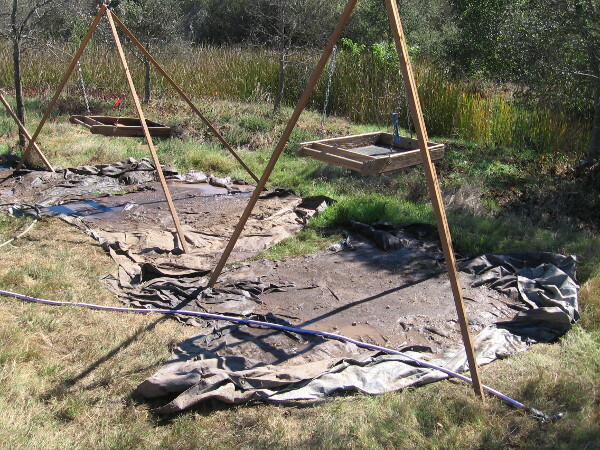 Nearby I saw several devices used for wet screening excavated soil, a process that follows dry screening. 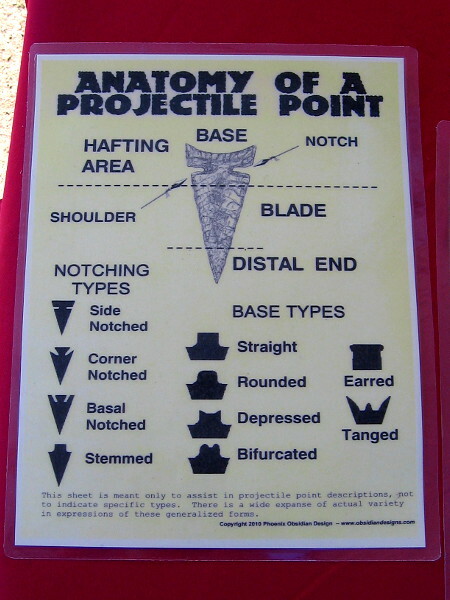 Smokey Bear must also be an archaeology enthusiast! I spotted him checking out debris left on the ground in another corner of the field, the area used for dry screening excavated soil! 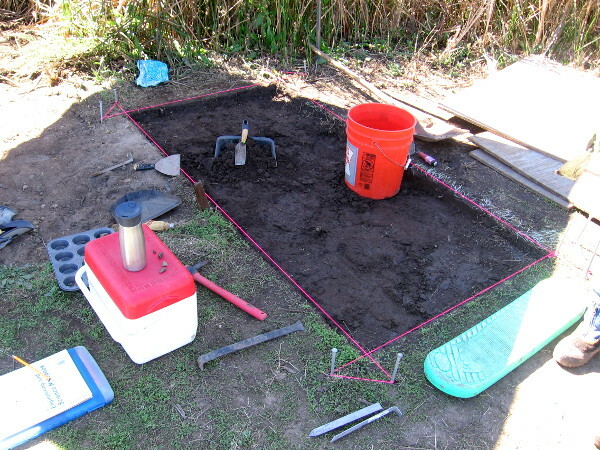 Posted on October 20, 2018 October 21, 2018 Tags anthropology, archaeology, education, environment, events, geology, historic places, history, native americans, photography, san diego, southern california, state parks, studentsLeave a comment on Learning about archaeology in San Diego! 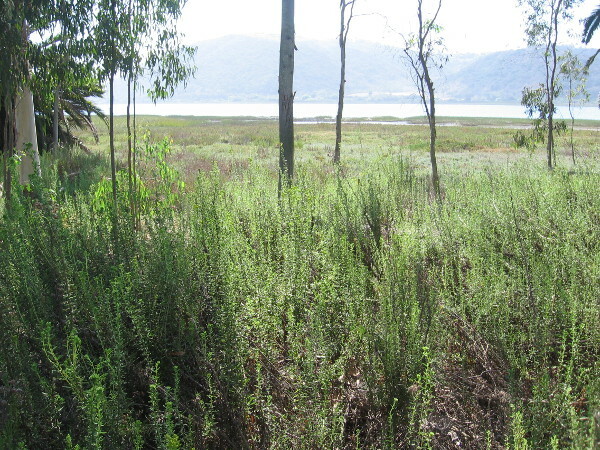 A short nature walk along a National City wetland. 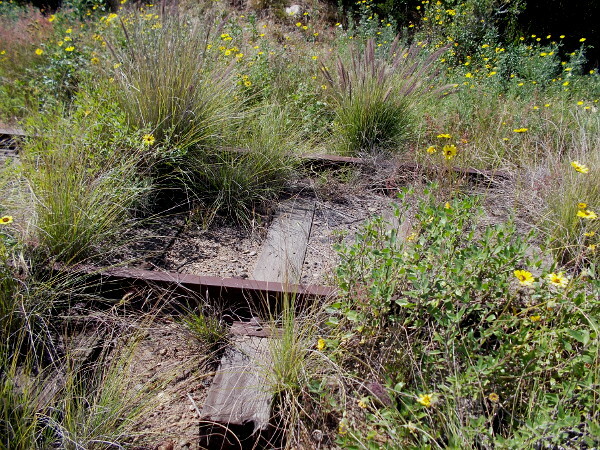 Rusty old train tracks are overgrown with wild vegetation, including many California bush sunflowers. I made a cool discovery the other day. 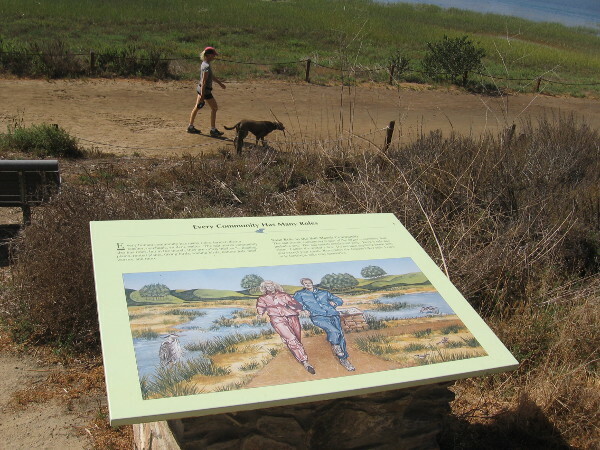 A little-known hiking path in San Diego’s South Bay provides a view of a beautiful natural wetland. 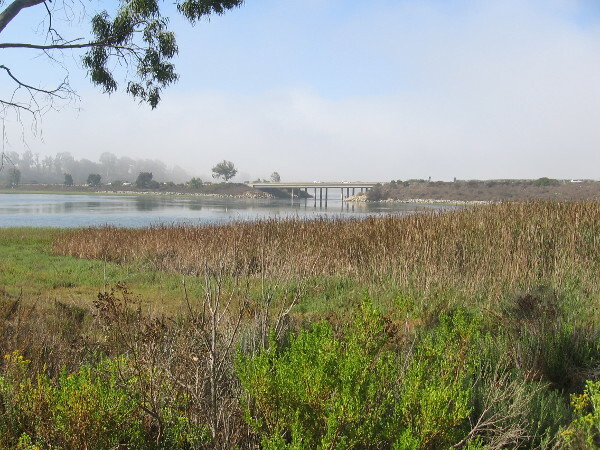 According to signs that I saw, the small estuary between Bay Marina Drive, Marina Way, Interstate 5 and the Sweetwater River is a protected wildlife refuge. 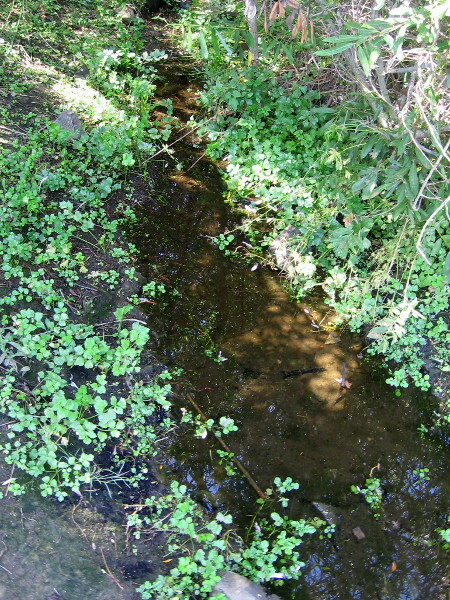 I believe, after looking at Google Maps, that the water flows from Paradise Creek. But I’m not certain. Perhaps someone reading this knows. 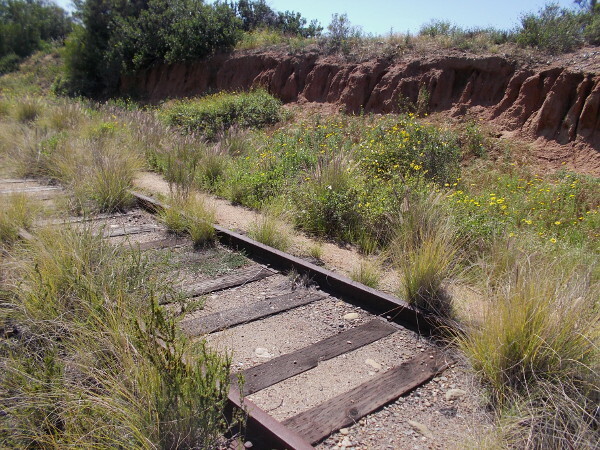 Long-unused train tracks that are partially concealed by vegetation run along the edge of the wetland, and so does a narrow footpath. I didn’t see any signs naming the trail, or any that prohibited a short hike. 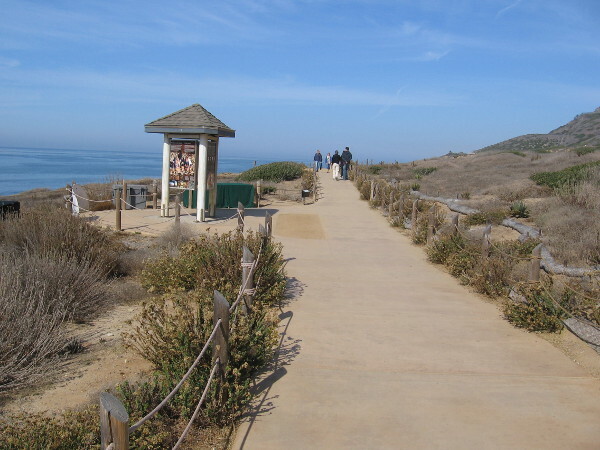 So I walked down it a bit, enjoying the fresh air and peaceful surroundings. 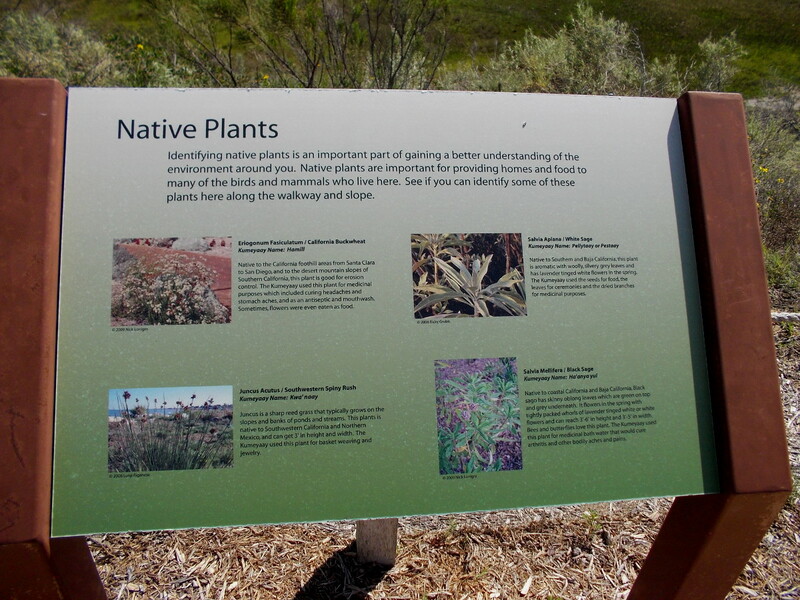 Information sign near edge of estuary identifies native plants. 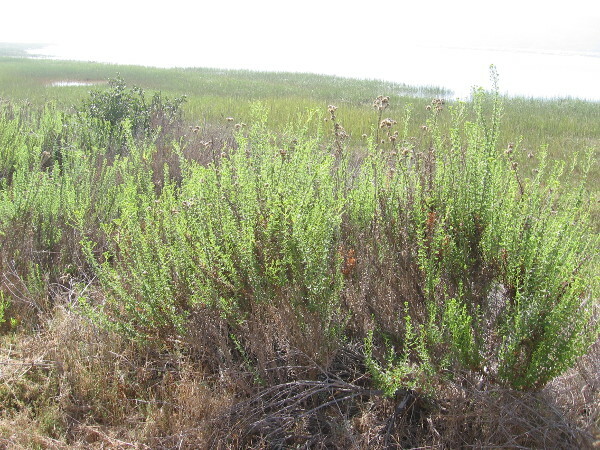 California Buckwheat, White Sage, Southwestern Spiny Rush, and Black Sage. 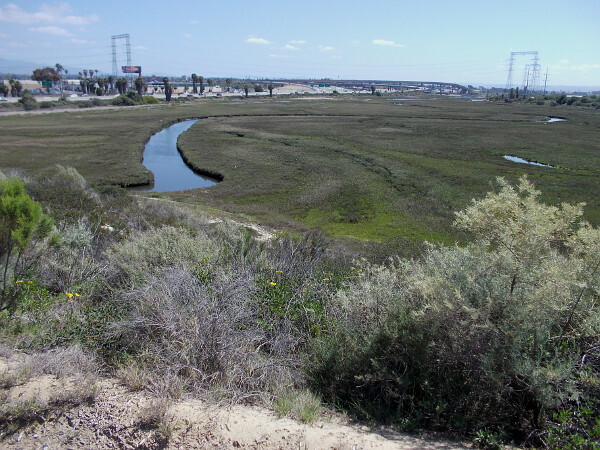 View of National City wetland from observation area south of the Best Western Marina Gateway hotel parking lot. 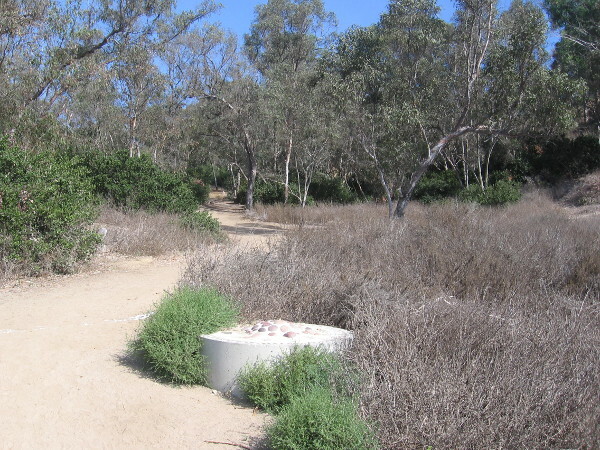 Beginning down the footpath on a sunny weekend day. 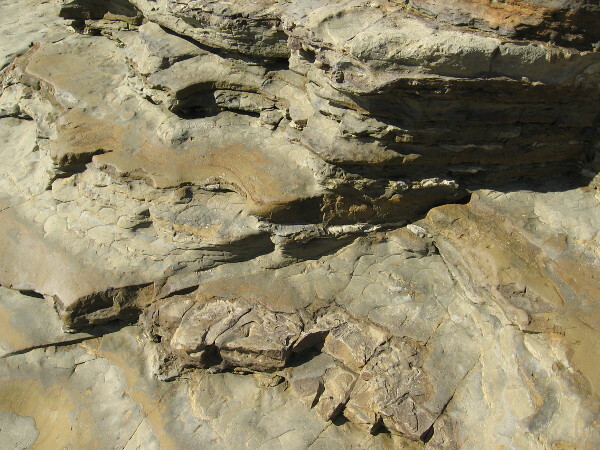 Some eroded sandstone adds beauty to the scene. 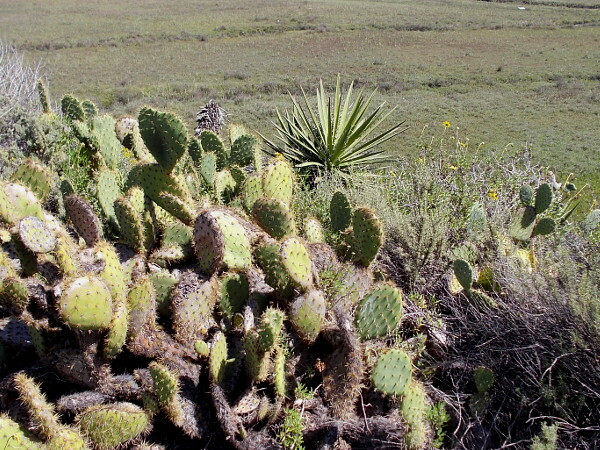 Prickly pear and chaparral yucca above a green estuary. 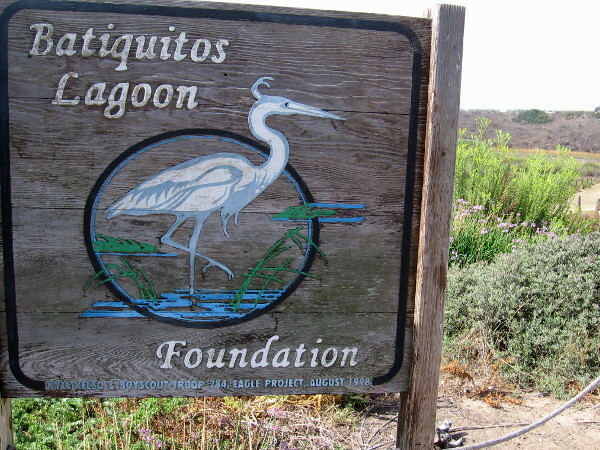 Beyond the sign lies a fragile wetland where native plants and animals are protected. 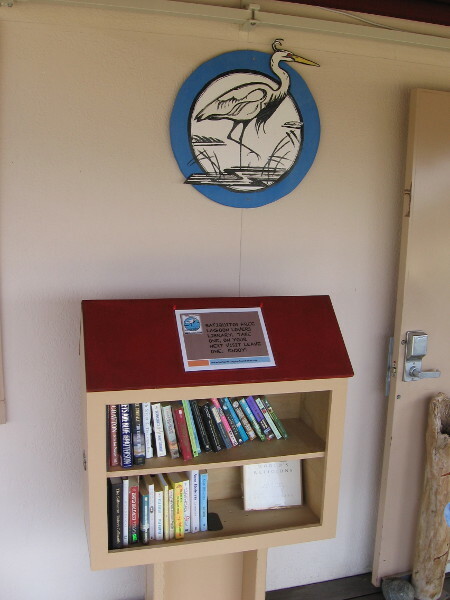 I saw some birds out in the wildlife refuge. I turned about after a short hike and headed on back to the hotel parking lot. On a later visit I discovered additional signs beside the hotel parking lot. They contain more interesting information. 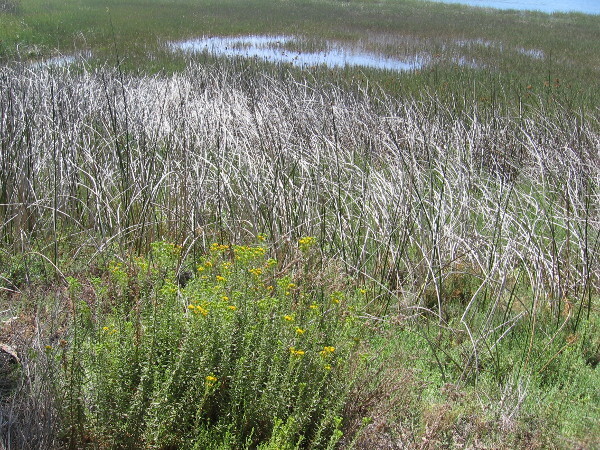 I learned this wetland is called Paradise Marsh. 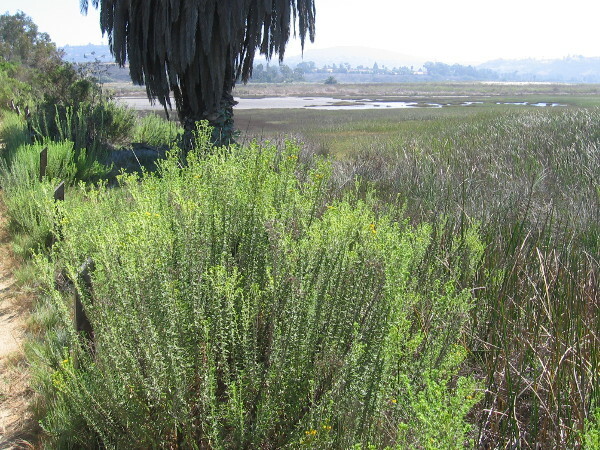 It’s an environmentally important tidal salt marsh that’s part of the much larger San Diego Bay National Wildlife Refuge. 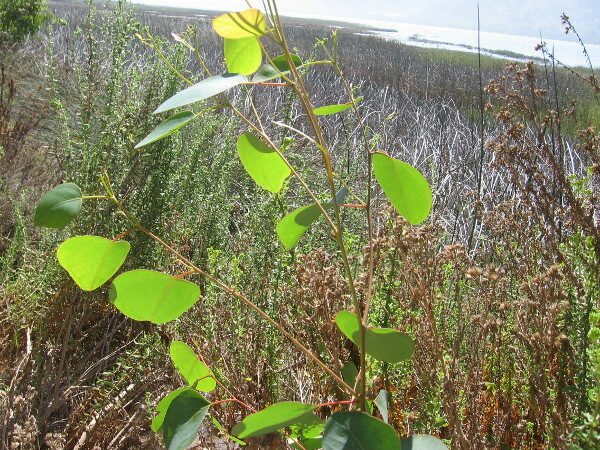 Water reflects bright sunlight in National City’s Paradise Marsh. 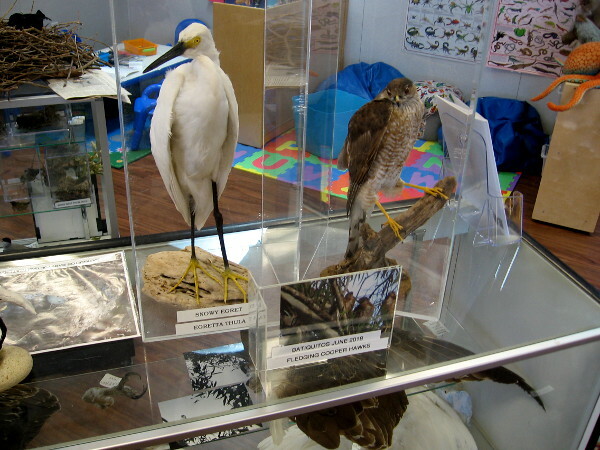 The birds of Paradise Marsh include the Willet, Mallard, American Avocet and the Great Blue Heron. 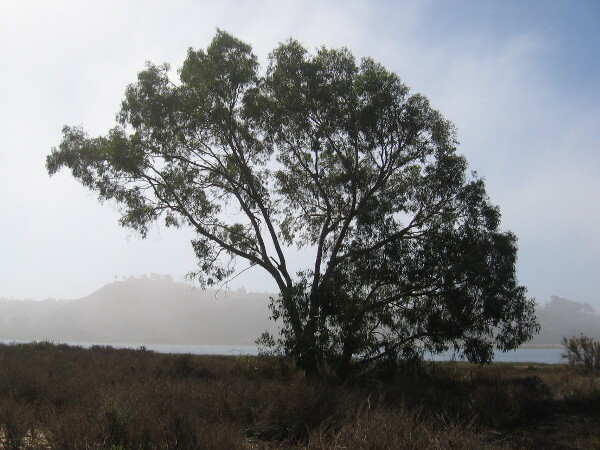 For hundreds of years, Native American tribes such as the Kumeyaay, Iapi or Tipai made their homes around the estuaries of San Diego Bay. 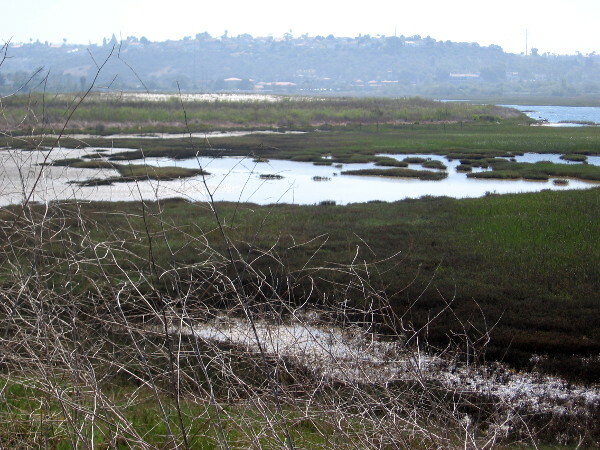 A beautiful tidal salt marsh wetland can be viewed in National City. Do you enjoy beautiful things? Visit my photography blog which I call A Small World Full of Beauty. 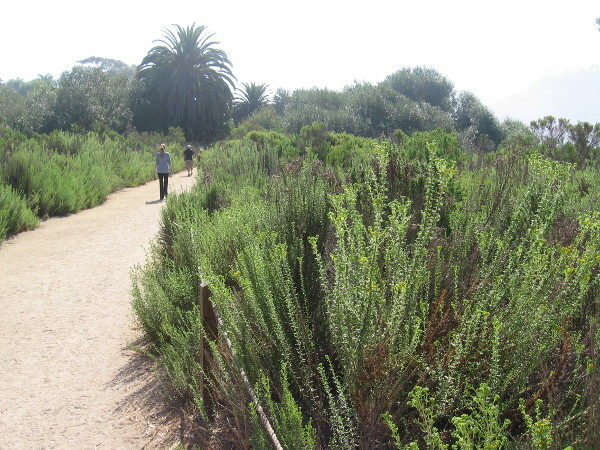 Posted on March 21, 2016 December 29, 2018 Tags beautiful, estuaries, flowers, geology, national city, nature, plants, rivers, south bay, sunshine, walking, wildlife10 Comments on A short nature walk along a National City wetland. 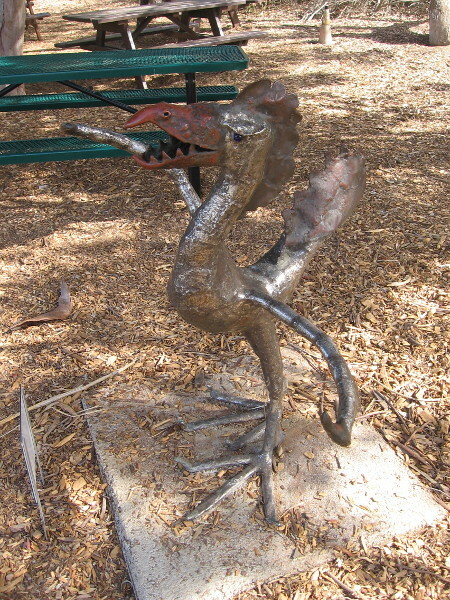 Listen to the Earth whisper at Fault Line Park! 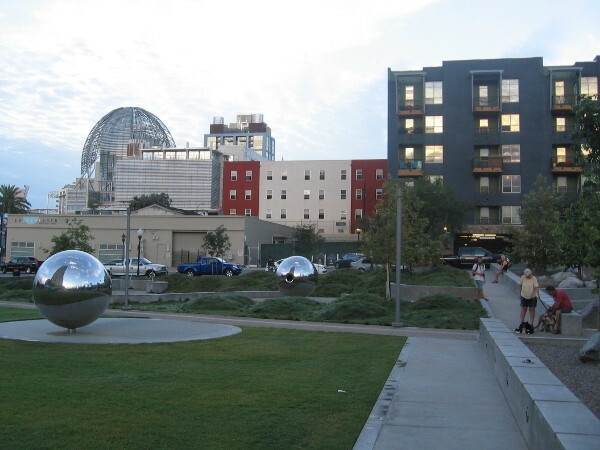 Morning photo of the new Fault Line Park in San Diego’s East Village. The Central Library’s dome is visible in the background. 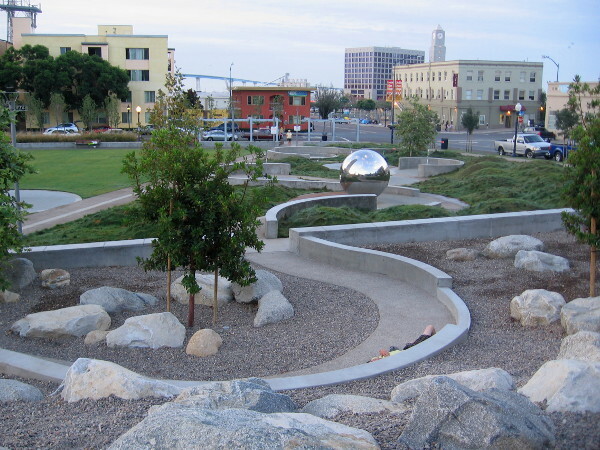 An incredibly cool new public park opened in East Village a couple weeks ago. 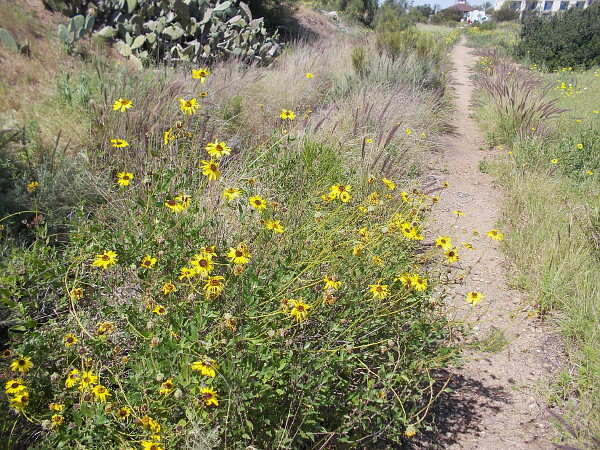 It’s called Fault Line Park, and is located south of Island Avenue between 14th and 15th Street. 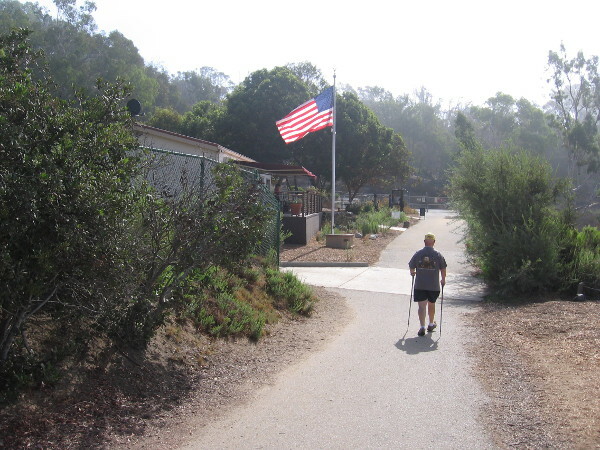 The park is situated directly above a shallow rupture of the Rose Canyon Fault System, which stretches through downtown San Diego. 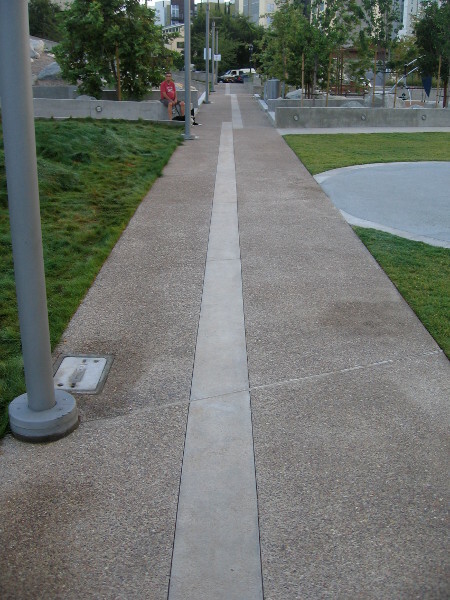 In addition to a children’s playground and places to sit and walk, the 1.3 acre Fault Line Park contains a really unique feature. 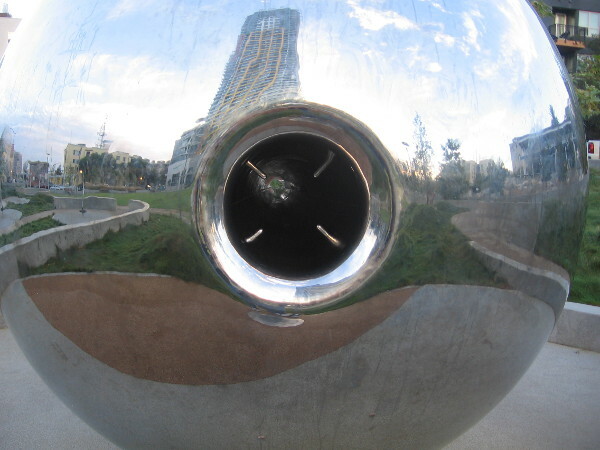 A public art installation, titled Fault Whisper, by artist Po Shu Wang of Living Lenses, allows visitors to monitor our active planet. 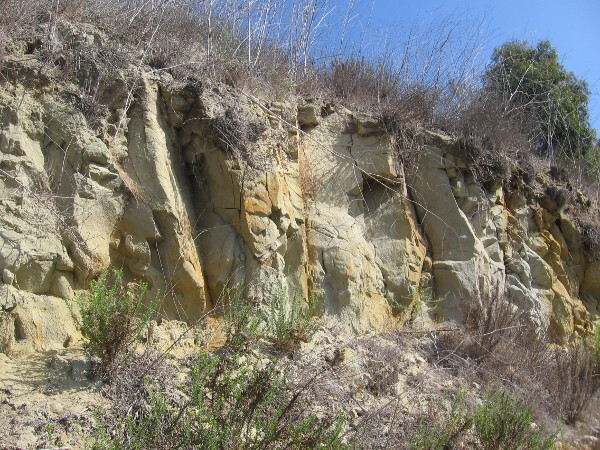 Large, shining spheres stand on either side of the fault line. 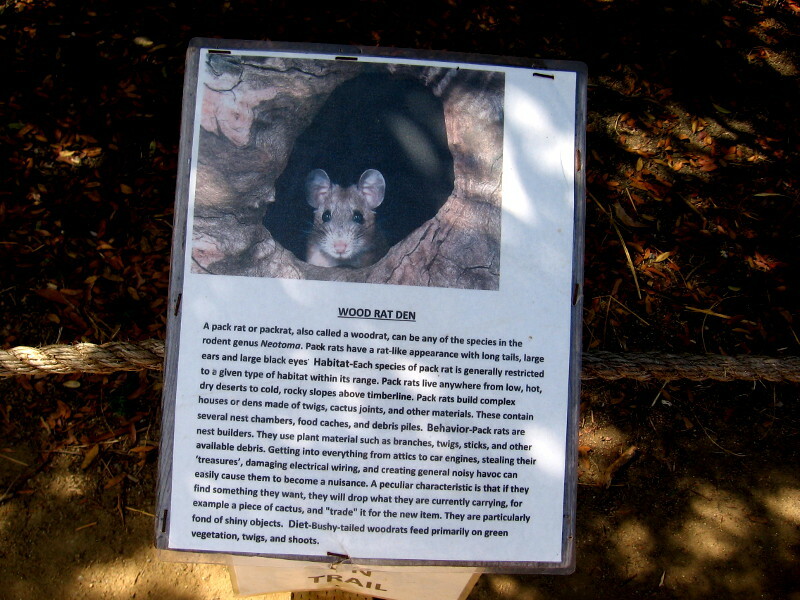 At the west sphere, curious ears can listen to the Earth’s subterranean movements, which are recorded by a seismometer embedded below in the actual fault! 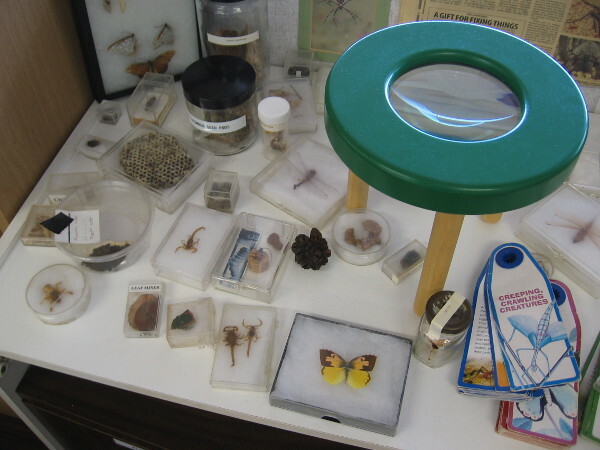 They can also look through an eyepiece toward the opposite sphere, to see whether the Earth has shifted! Even though I listened intently, I couldn’t hear the Earth whispering early this morning when I took these pics. Perhaps old Mother Earth was still sleeping! 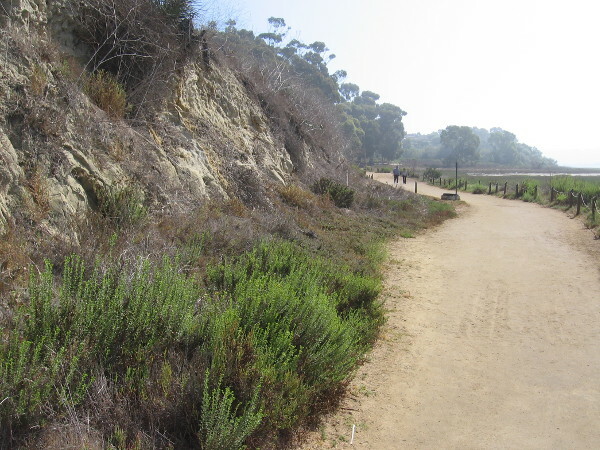 This line marks where a part of the Rose Canyon Fault System has ruptured, just 14 feet below the surface. 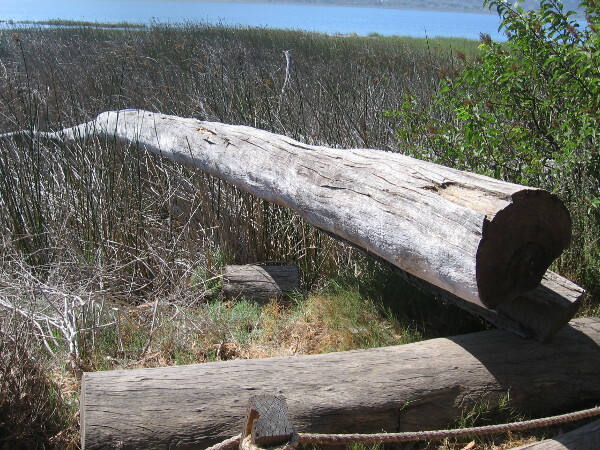 According to geologists, there’s no great earthquake danger here. 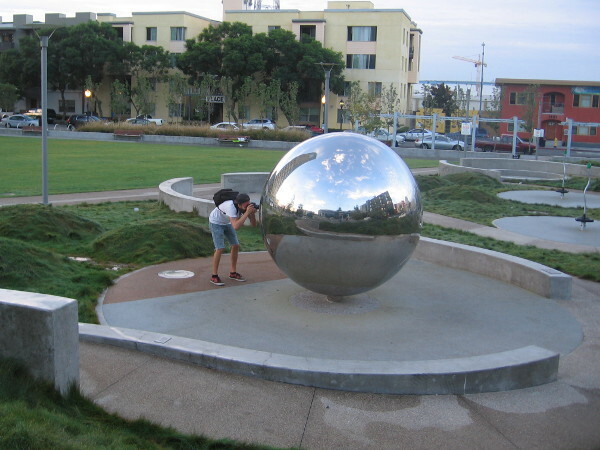 Photographer records cool reflections in one of the large stainless steel spheres in Fault Line Park. 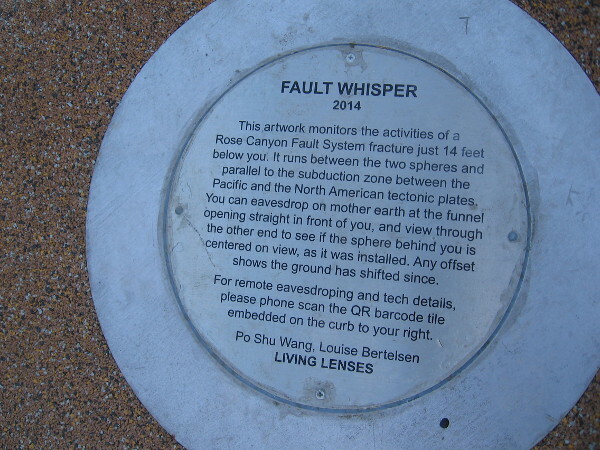 Plaque describes Fault Whisper public art, created by Po Shu Wang in 2014. 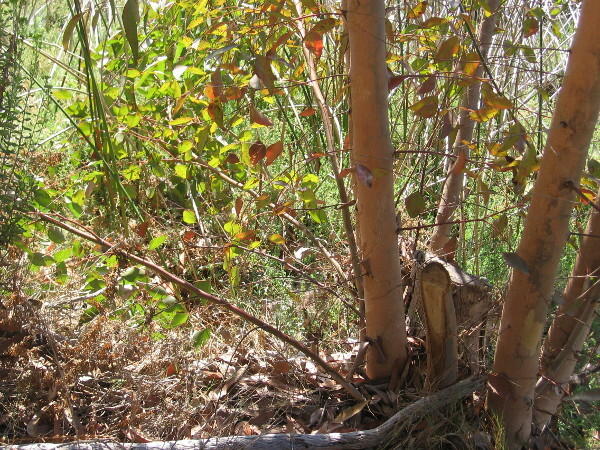 Two spheres stand on either side of the fault line. From one you can listen to the Earth and monitor movement. Here’s the opening where you can press your ear to listen. There’s a speaker just inside. 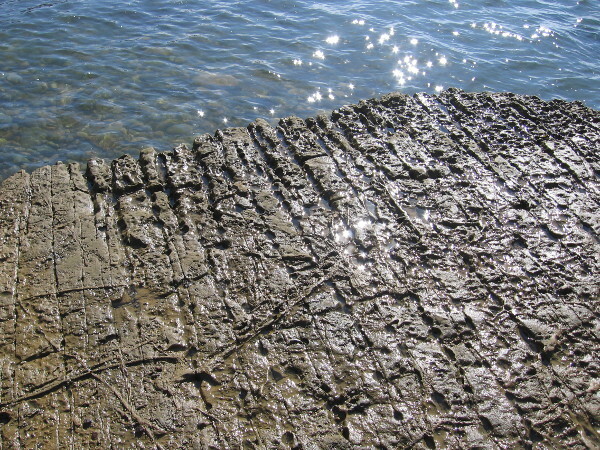 The Earth’s movements are translated into musical notes. 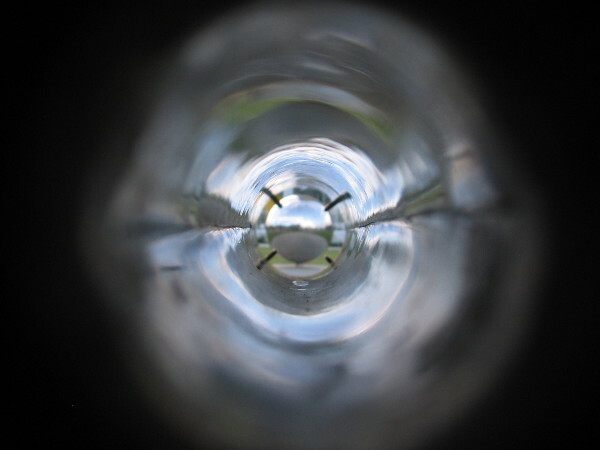 Looking through eyepiece at the opposing sphere. 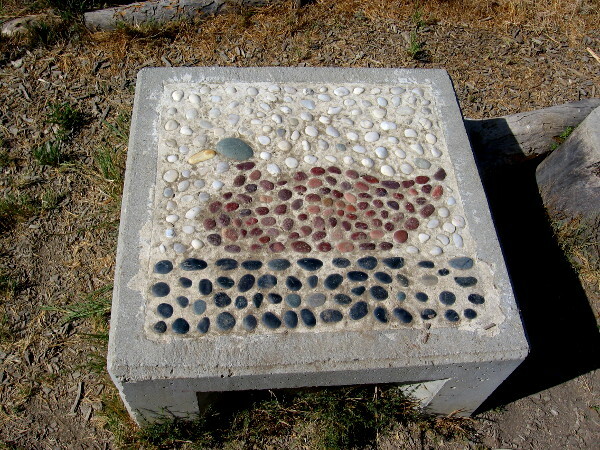 If the Pacific and North American tectonic plates have shifted since the art’s installation, it isn’t very noticeable. 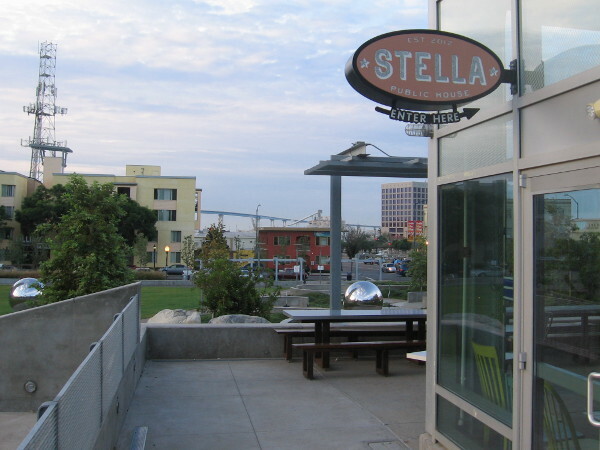 Stella Public House restaurant in East Village is located right next to the cool new Fault Line Park. 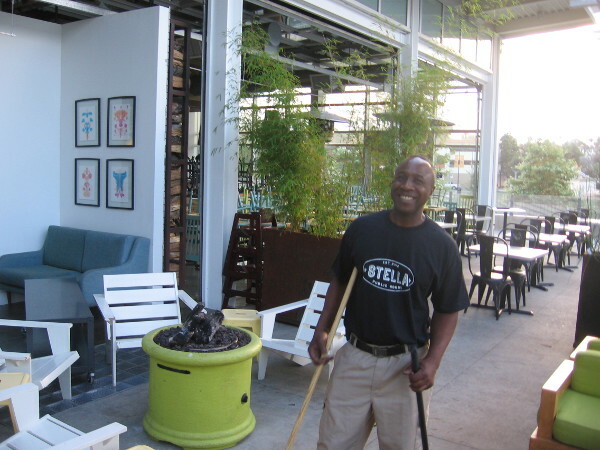 If Stella Public House is as awesome as the super friendly employee I met, you’d better head over there at once! View of Fault Line Park in East Village from outdoor patio shared by Stella Public House and Halcyon coffeehouse and cocktail lounge. 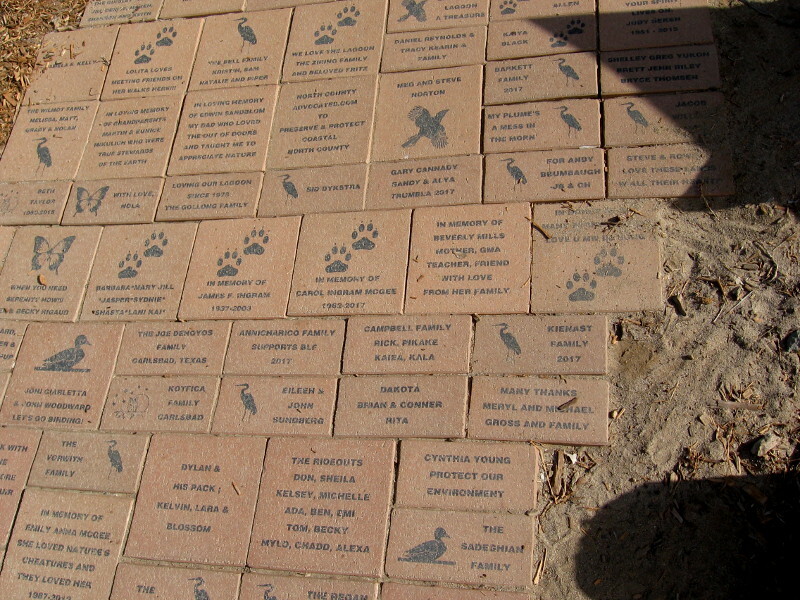 Follow this blog for more photos of cool stuff! Join me on Facebook or Twitter. 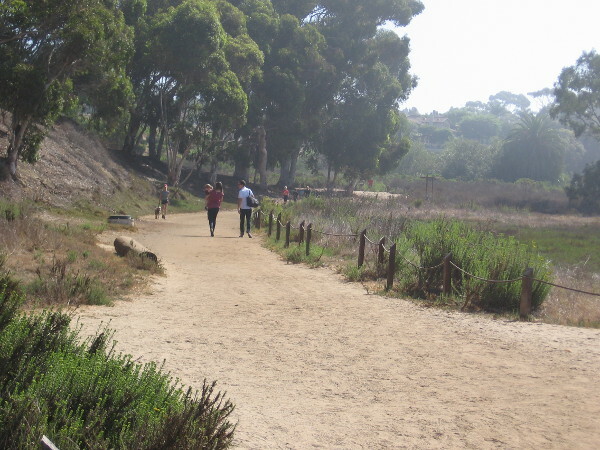 Posted on September 10, 2015 September 11, 2015 Tags art, artists, city life, cool, downtown, earthquake, east village, geology, parks, public art, san diego, science, technology, unusual8 Comments on Listen to the Earth whisper at Fault Line Park!